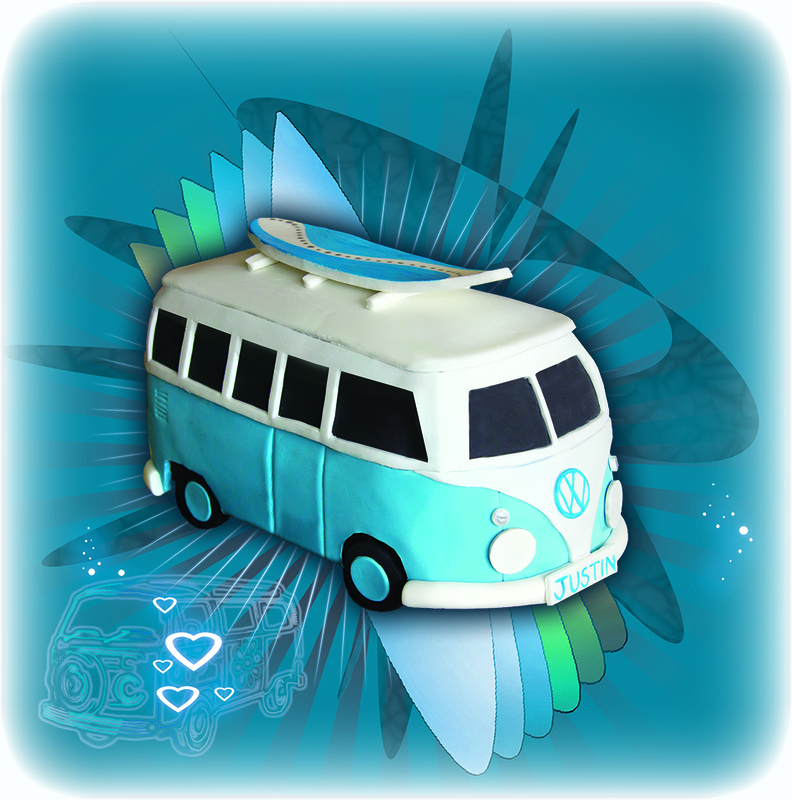 This cute Kombi is just 6.5″ long by 3.5″ wide and is a smaller and cuter version of my usual VW Kombi. It is made from dark chocolate mud cake filled and covered with dark chocolate ganache with a layer of sugar-paste on top. 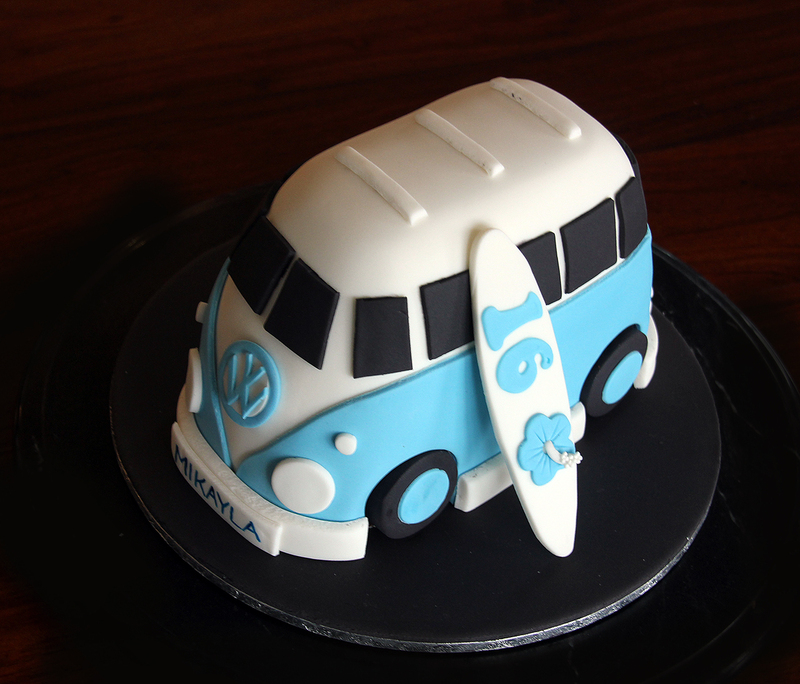 This little cake will serve 16 dessert portions. Cut out your set up board from a sheet of thin card with a glossy side. Shape it into a van shape approx. 6″ x 3″. Your board should be a little larger than your cake so that you fill the gap with ganache and use the edge of your set up board to guide your scrapper giving you a smooth finish. Use a non slip mat under your set up board. 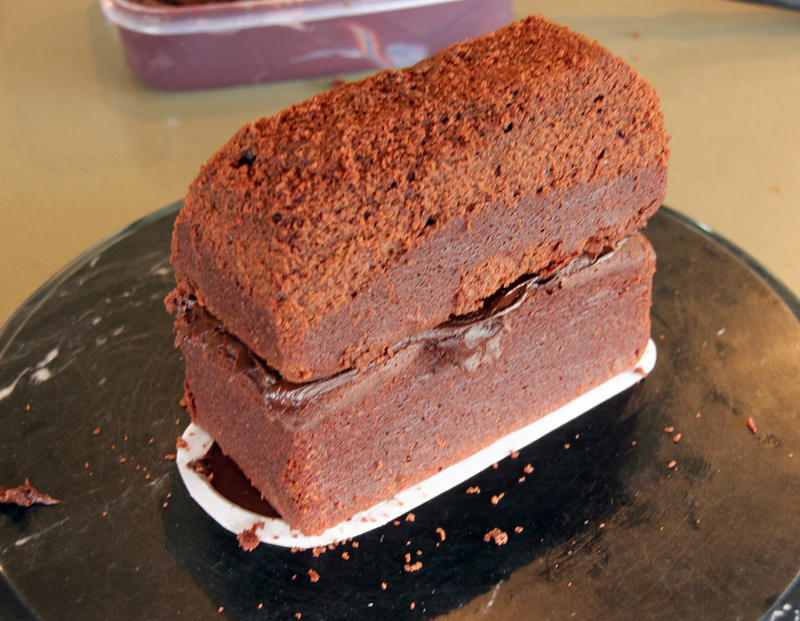 Grease and line base and sides of cake pan with one thickness of baking paper, bringing paper 5cm above side of pan. Combine chopped butter, chopped chocolate, coffee, and water in a saucepan. Stir over low heat until chocolate is melted. Cool 15 minutes. Transfer mixture to bowl of mixer. Add caster sugar to mixture and beat well until dissolved. Add sifted flour and cocoa, lightly beaten eggs and vanilla and mix till combined. Pour mixture into prepared pan. Bake at 150C for 1-1 hour 15 mins. Test with skewer. Cool cake in pan. Heat the cream until it just starts to bubble, pour over chocolate (which you have blitzed in the food processor to coffee granules size) and let it sit for about a minute to melt. Use a hand whisk to blend it all together then set aside to cool. Your ganache at this point will be thin and you will have to let it set overnight until it thickens to a slightly thicker peanut butter consistency. Since I don’t have the patience to wait, I just let it cool to room temperature and then pop it in the fridge (don’t cover because you might get condensation). It would usually set in the fridge in under an hour. If it sets too hard, just microwave it in 10 second intervals (keep mixing it whenever you take it out). 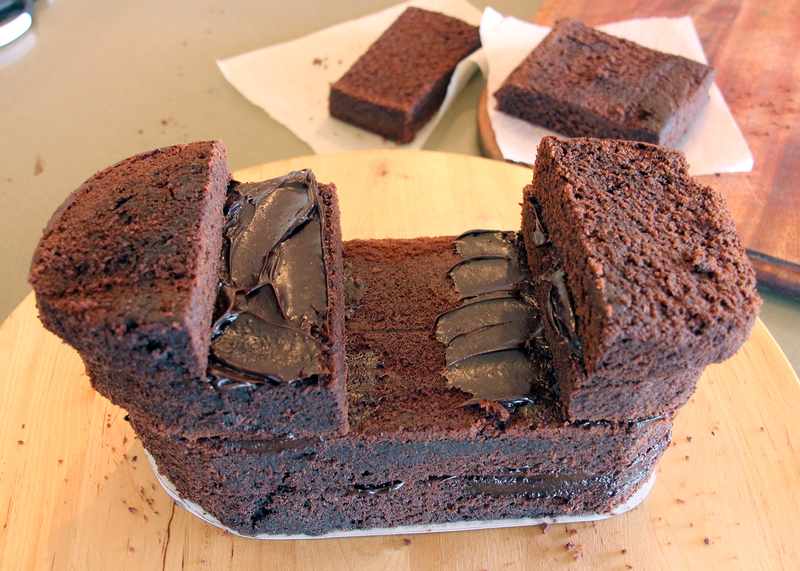 Cut your cake in half and stick one half to your set up board with some ganache. Level the top. Spread with a layer of ganache. Add the remaining piece of cake on top and shape the roof. 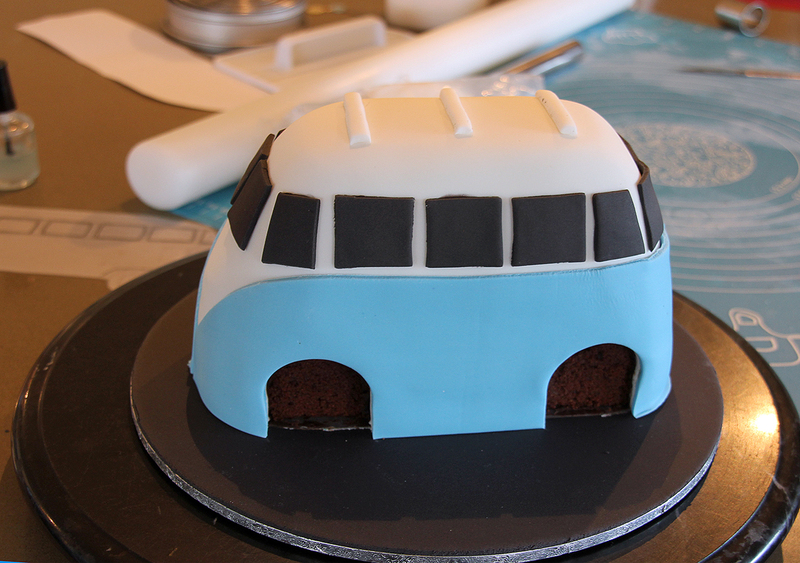 Use some of the cut offs to fill in the rounded front of the van and use a sharp knife to create a believable van shape then cover with a thin coat of ganache (crumb coat). 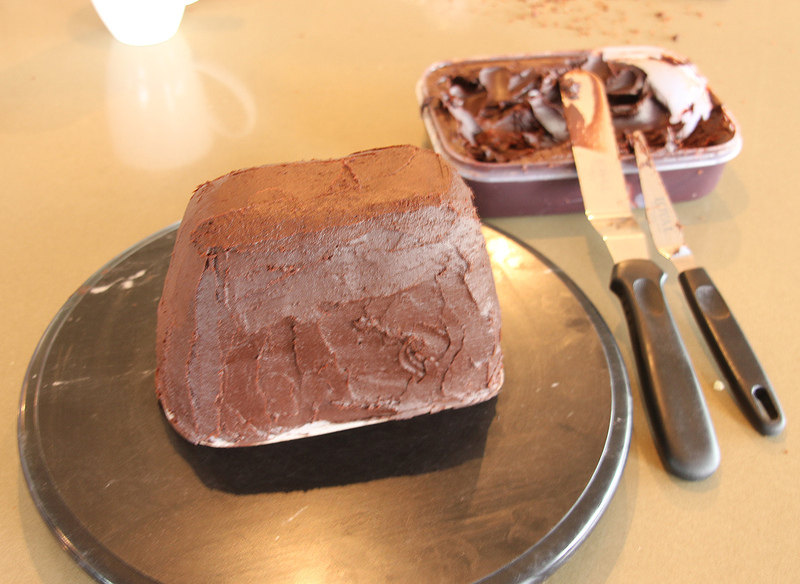 Put the cake in the fridge for around 30 mins to firm up then add more ganache and create the final smooth shape. Pop the cake back in the fridge or leave overnight on the bench to harden. 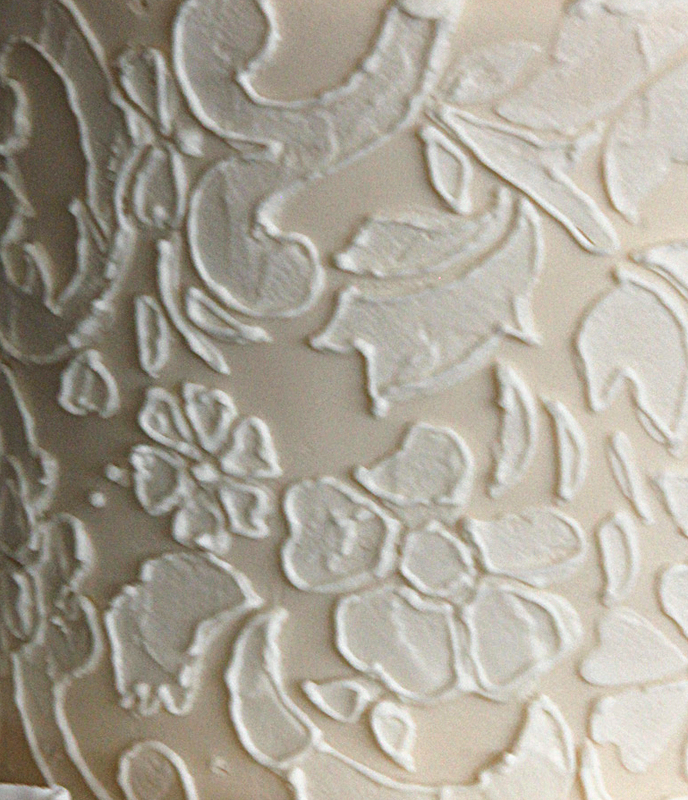 Cover with white sugar-paste. 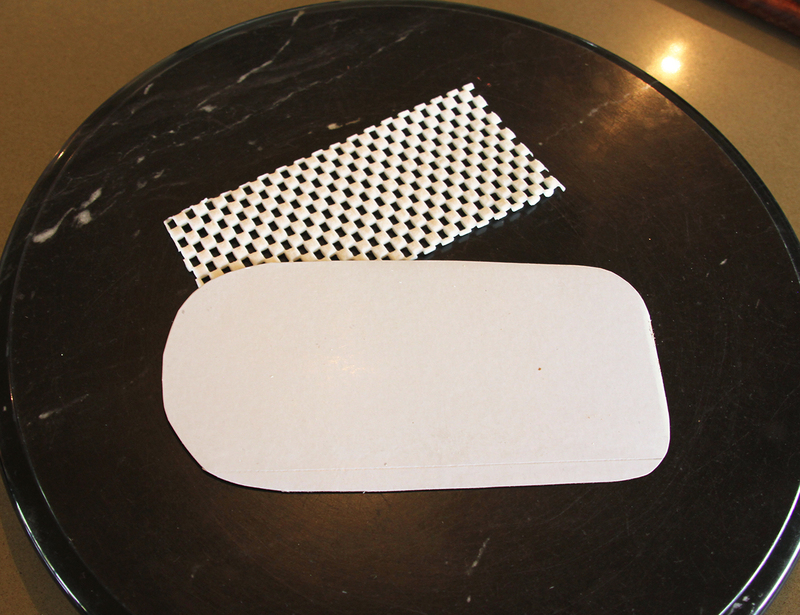 Cut out a surf board template and use it to cut out a white sugar-paste surf board. Cover the cake board with black sugar-paste. Cut out a template for the blue lower section. I cut out each side separately and then joined them neatly at the back. Cut out the wheel arches using a cutter then use the same cutter to cut out the wheels. 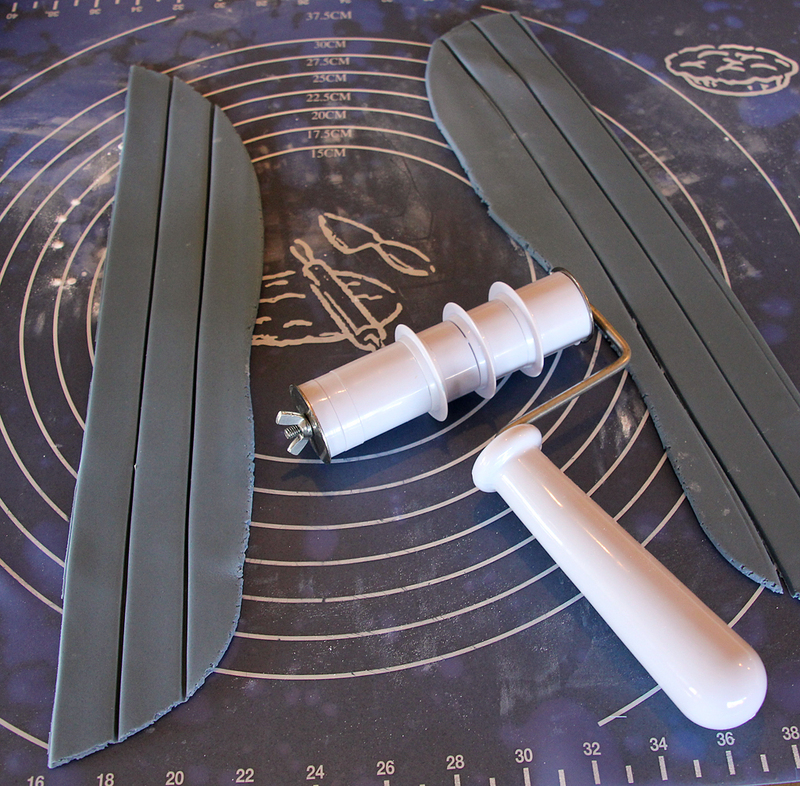 Use black sugar-paste for the windows and white for the roof rack. 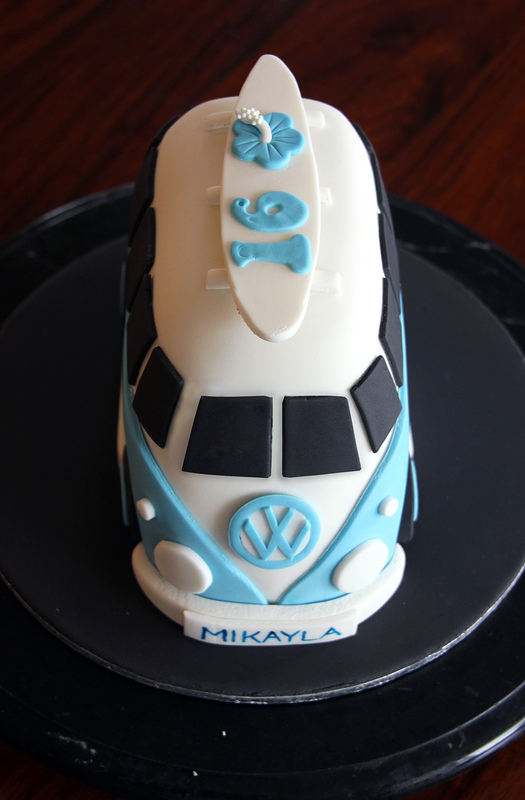 To make the VW badge cut out a large circle of blue sugar-paste then cut out the middle and replace with a white sugar=paste circle of the same size. 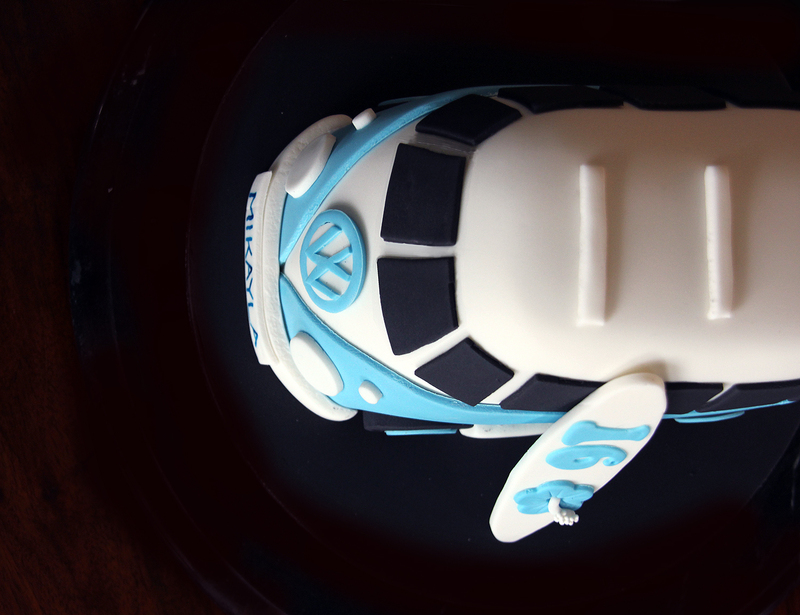 Use a scalpel to cut out the VW detail freehand from a thin piece of blue sugar-paste. Decorate the suf board with cut outs or paint on a design. Add lights, bumpers and number plates. Attach the wheels with a blob of Royal icing. Either place the surf board on top or leaning against one side. This fabulous cake took a good many hours to complete but I think it was worth every minute of my time. 8″ round x 4.5″ high. You could alter these sizes a little with no great consequence. 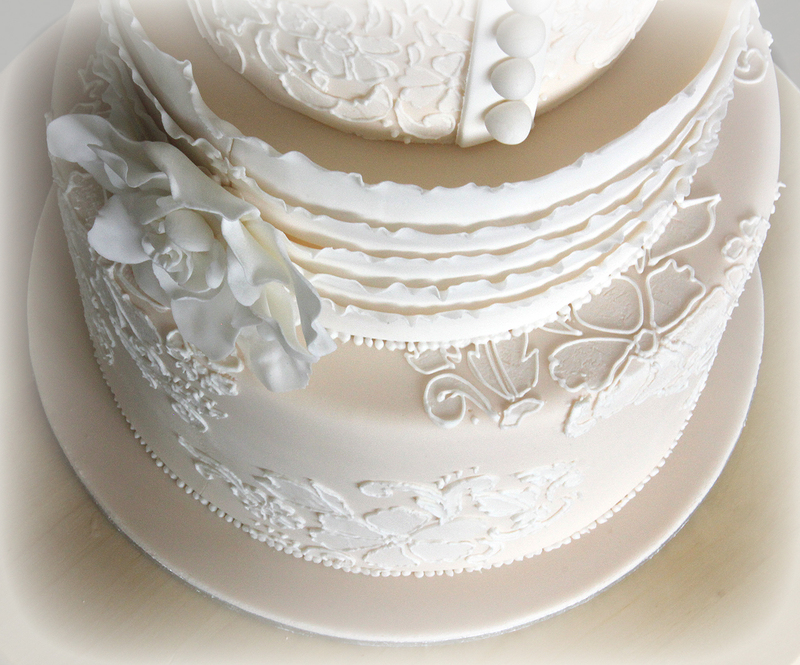 I would like to show you how to achieve a stunning lace effect on a cake using stencils and piping. 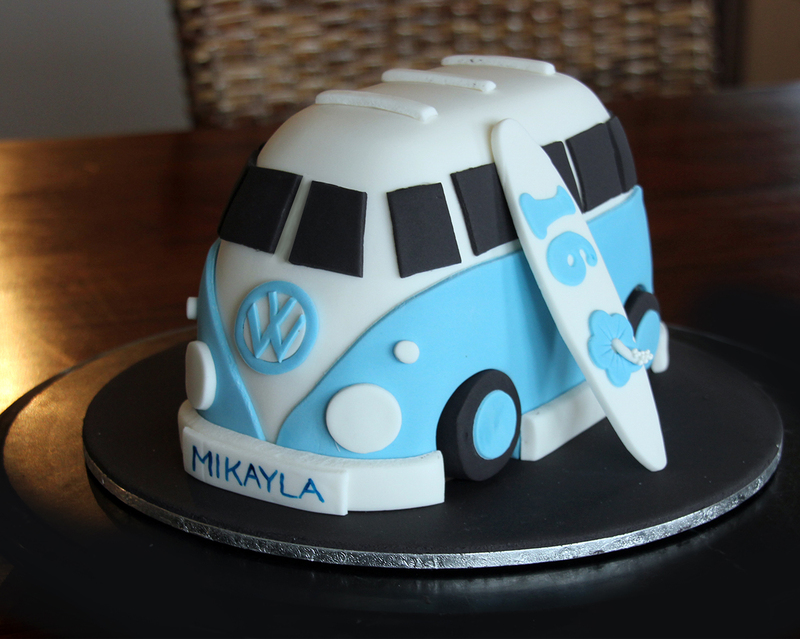 To get the best possible results use a different colour of stencil icing from the colour of your cake. This cake is champagne and the Icing for the stencil is white. 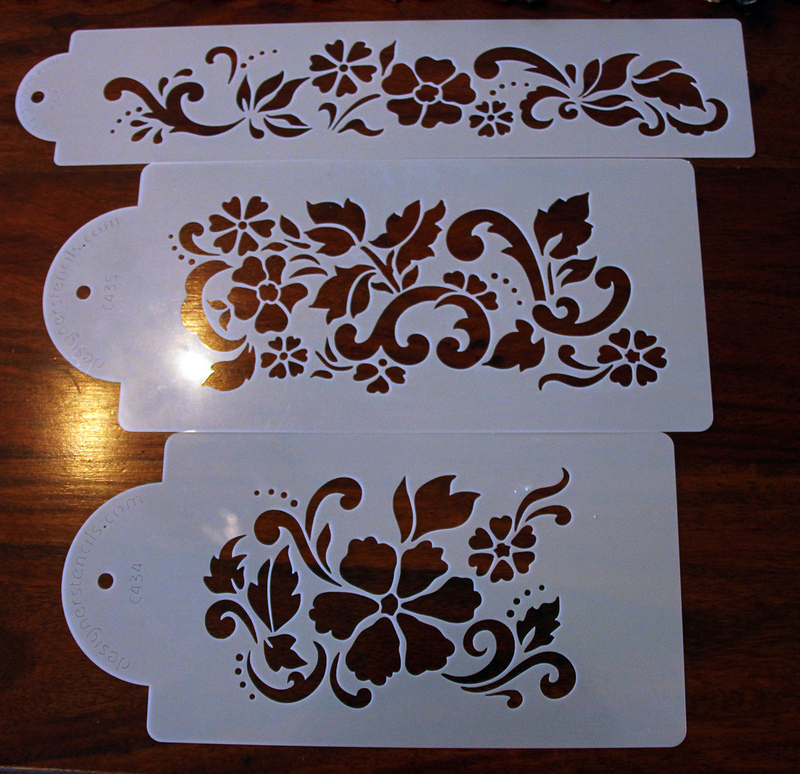 I used 3 of the set of 4 Designer Stencils. 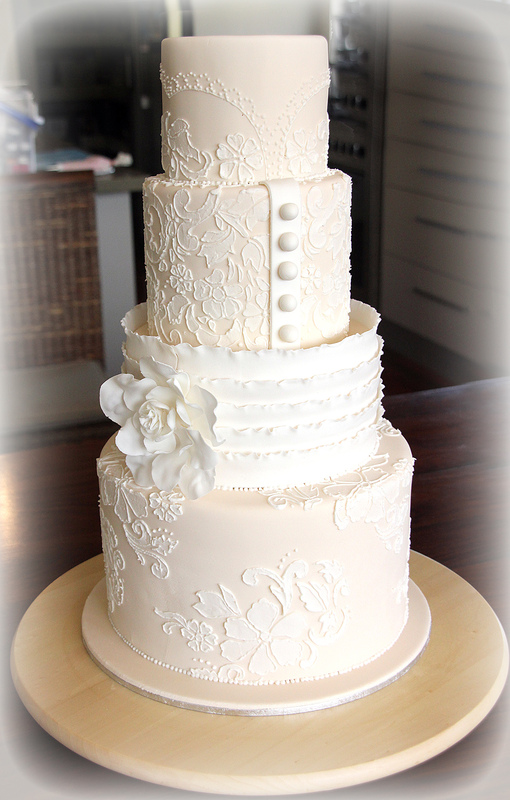 I will be stencilling the second from top tier of this 4 tiered cake, the tier with the buttons. As this tier will be stencilled all over I will need to position my stencil vertically and fix in position with pins or tooth picks. 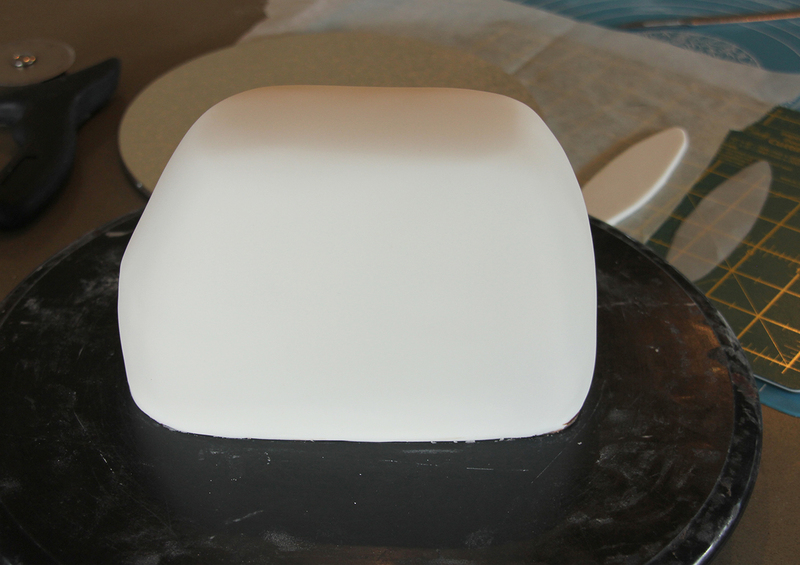 Mix up some white Royal Icing (RI) till it forms soft peaks and apply a thin coat using a bendy scrapper. 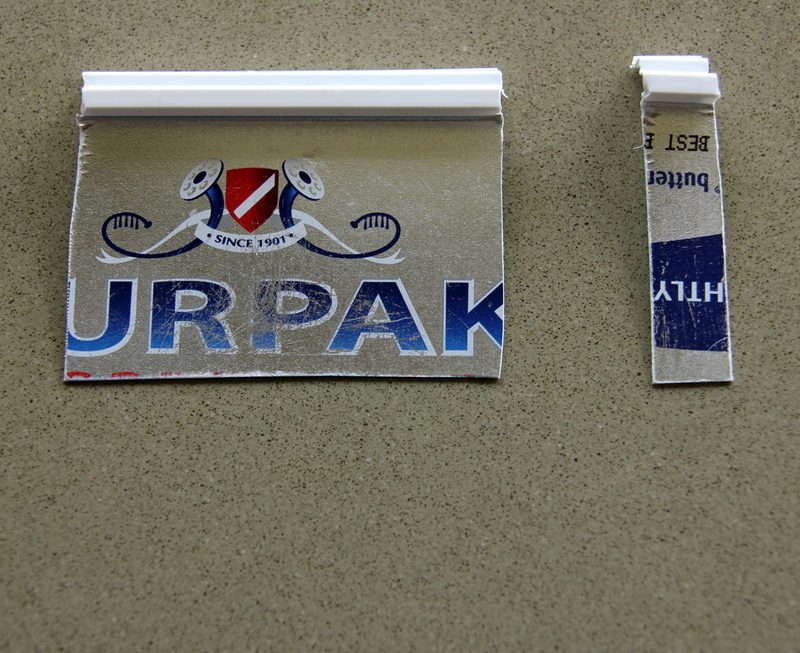 I made my scrappers in various widths from square and rectangular Lurpak / margarine tubs. 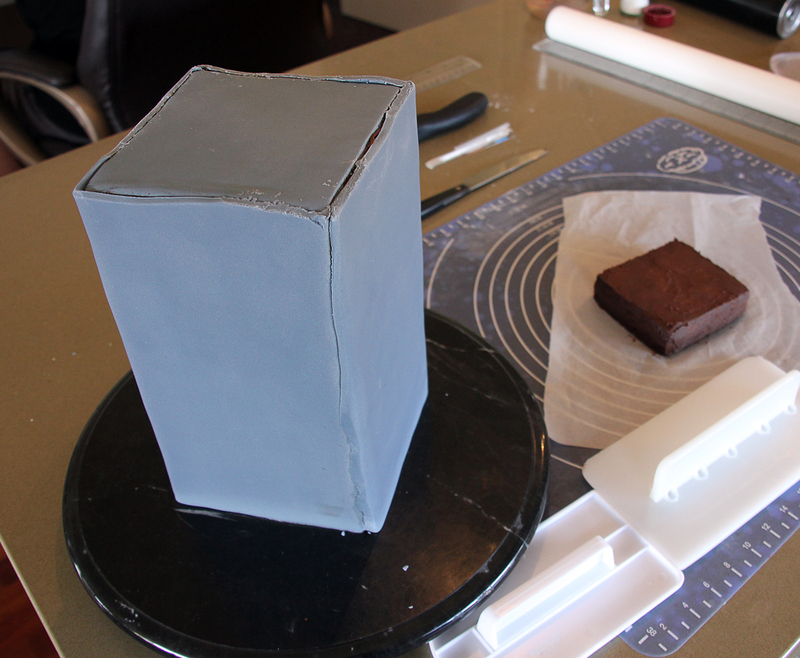 Once you have stencilled the sides of the cake, this tier requires that you stencil on top. 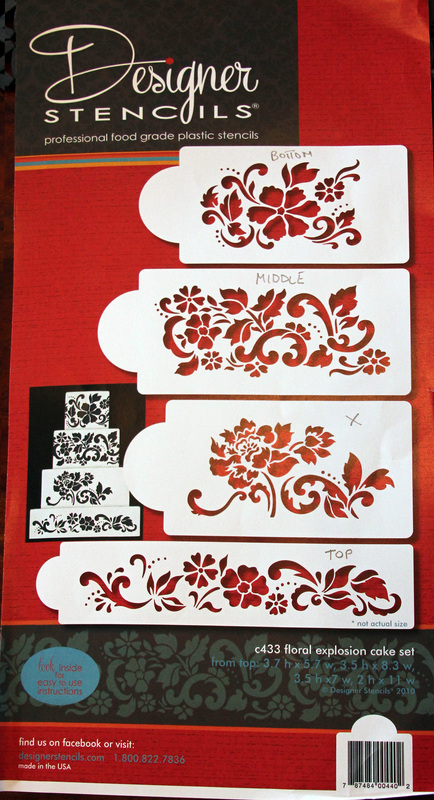 Try to align the stencil with the pattern on the sides and complete in segments. 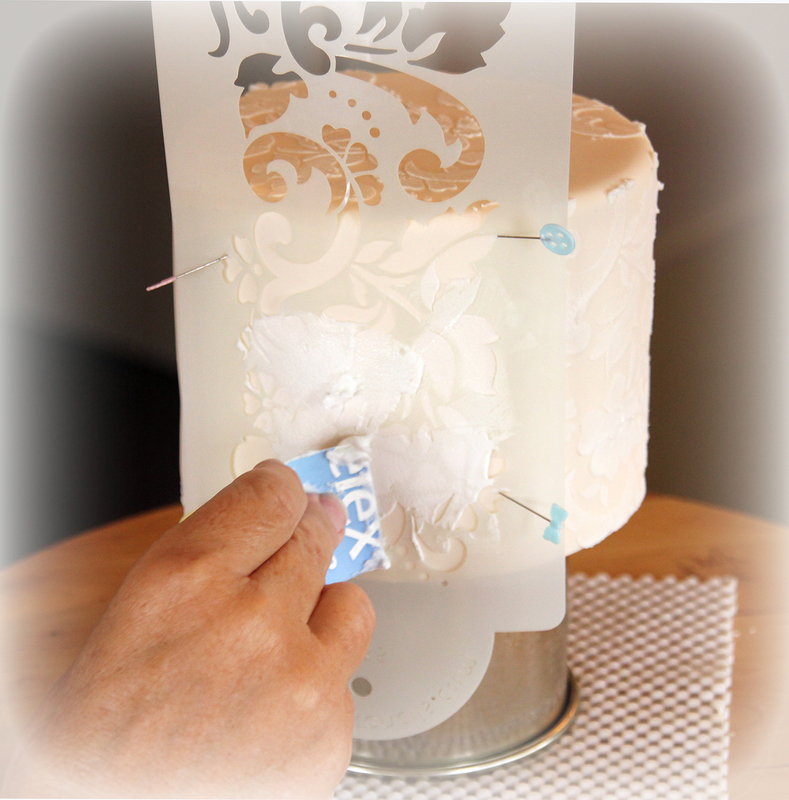 To get the full lace effect on your finished cake you will need to outline all the stencilled flowers and leaves with RI using a piping bag fitted with a small tip ( 00, 0 or 1 ). 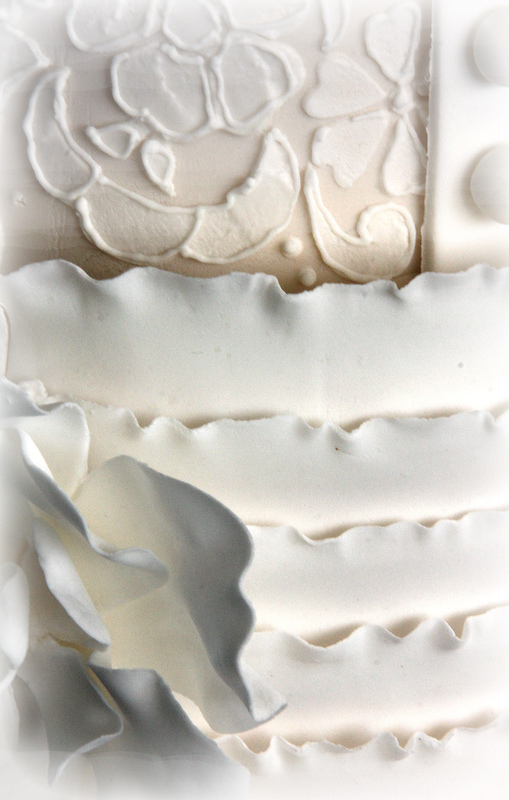 This is very time consuming but gives a fabulous lacy texture to your cake. Please also visit my website at http://www.cutesweetthings.com to purchase a cake or just to browse my cake galleries. 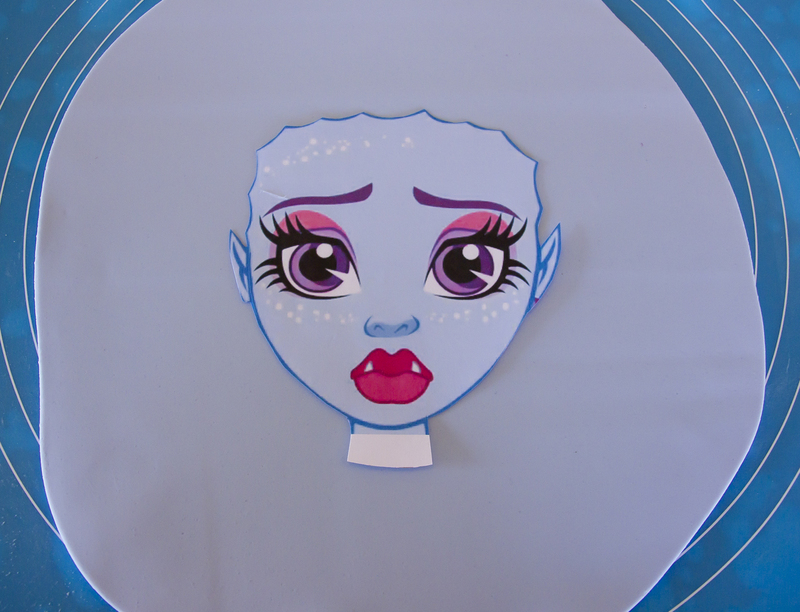 …welcome to Monster High, the place where children of famous monsters rule the school! 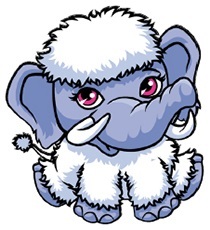 Abbey Bominable is 16 years old and the daughter of Yeti! 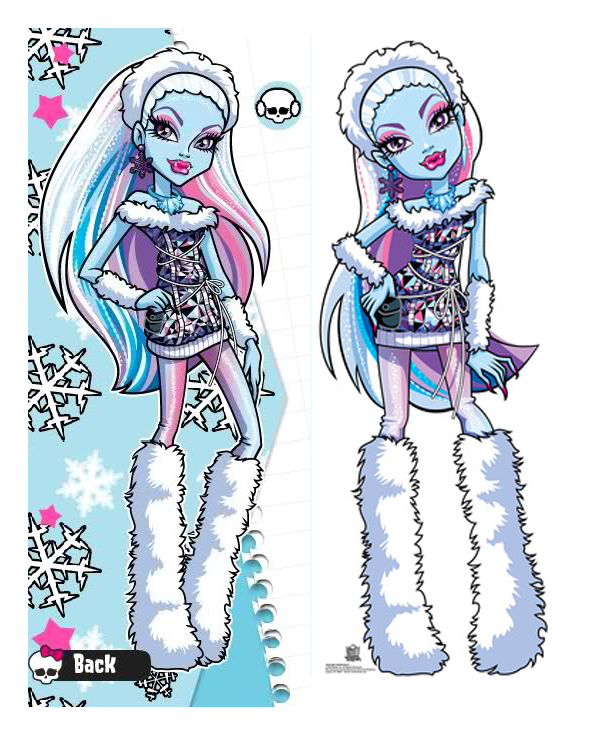 She’s the coolest ghoul in the school and I love her trendy wardrobe and white fur boots. 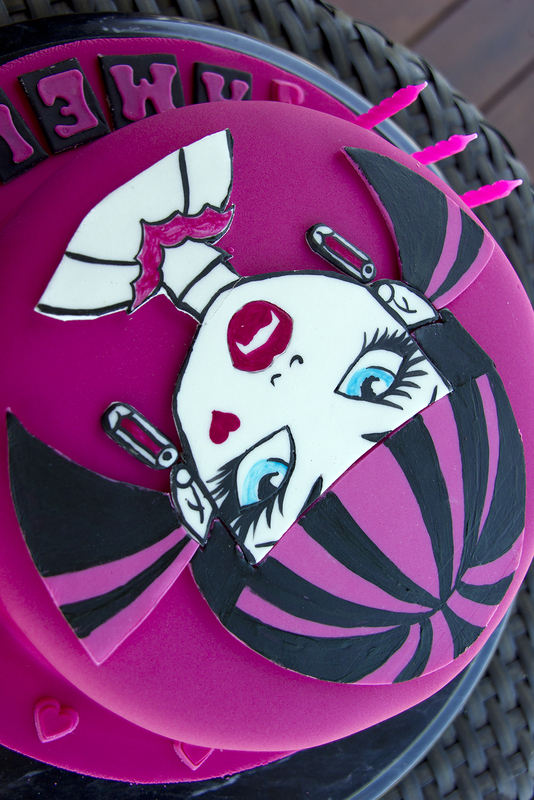 Her BFF is Draculaura and I have a Draculaura cake tutorial that you might like here. Her favourite sport is Snow Boarding and her pet “shiver’ s an adorable baby Wooly Mammoth. 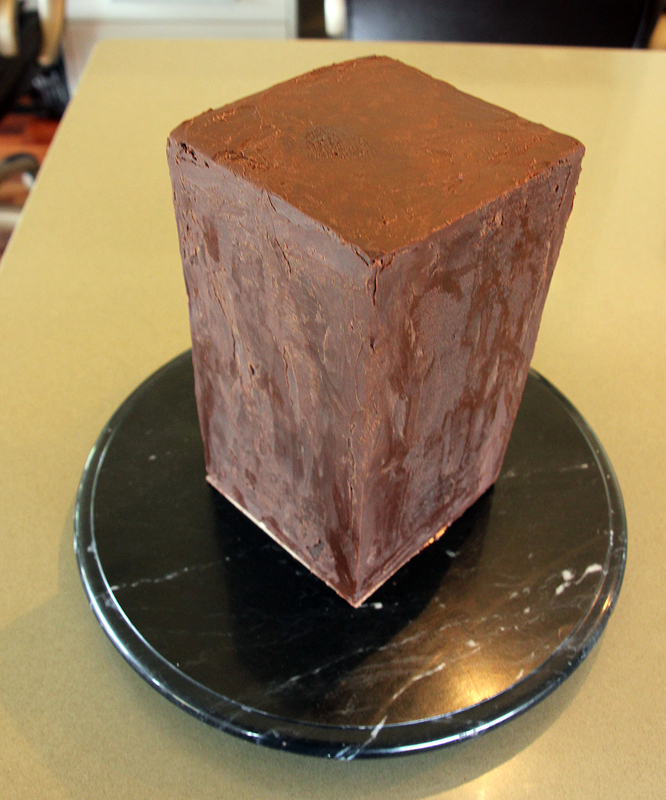 This 7″ Abbey birthday cake is made from dark chocolate mud-cake and filled with dark chocolate ganache. 1. 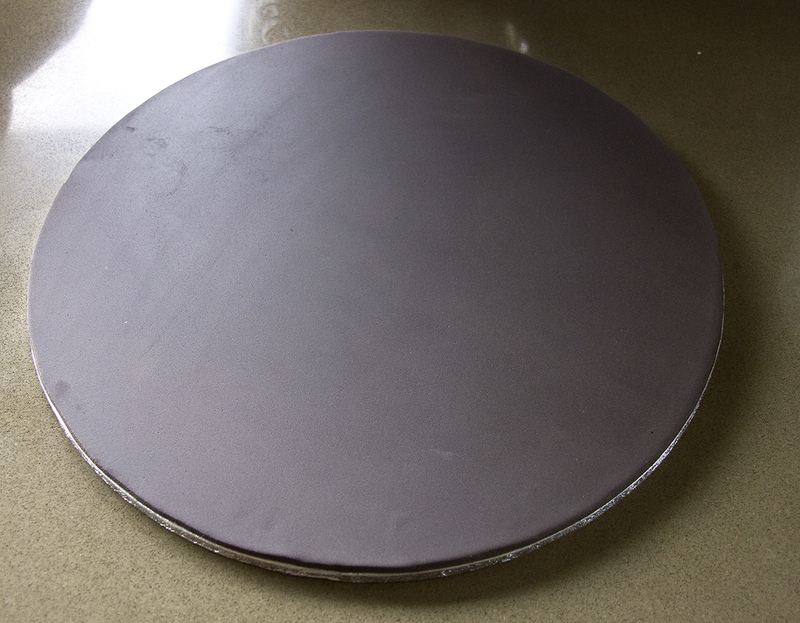 Grease and line base and sides of cake pan with one thickness of baking paper, bringing paper 5cm above side of pan. 2. Combine chopped butter, chopped chocolate, coffee, and water in a saucepan. Stir over low heat until chocolate is melted. Cool 15 minutes. Transfer mixture to bowl of mixer. 3. Add caster sugar to mixture and beat well until dissolved. Add sifted flour and cocoa, lightly beaten egg and vanilla. 4. Pour mixture into prepared pan. 5. Bake at 150C for 1 – 1.5 hours . Test with skewer. Cool cake in pan. Heat the cream until it just starts to bubble, pour over chocolate (which you have blitzed in the food processor to coffee granules size) and let it sit for about a minute to melt. Use a hand whisk to blend it all together then set aside to cool. Your ganache at this point will be thin. You will have to let it set overnight until it thickens to a slightly thicker peanut butter consistency. Since I don’t have the patience to wait, I just let it cool to room temperature and then pop it in the fridge (don’t cover because you might get condensation). It would usually set in the fridge in about an hour or two. If it sets too hard, just microwave it in 10 second intervals (keep mixing it whenever you take it out). 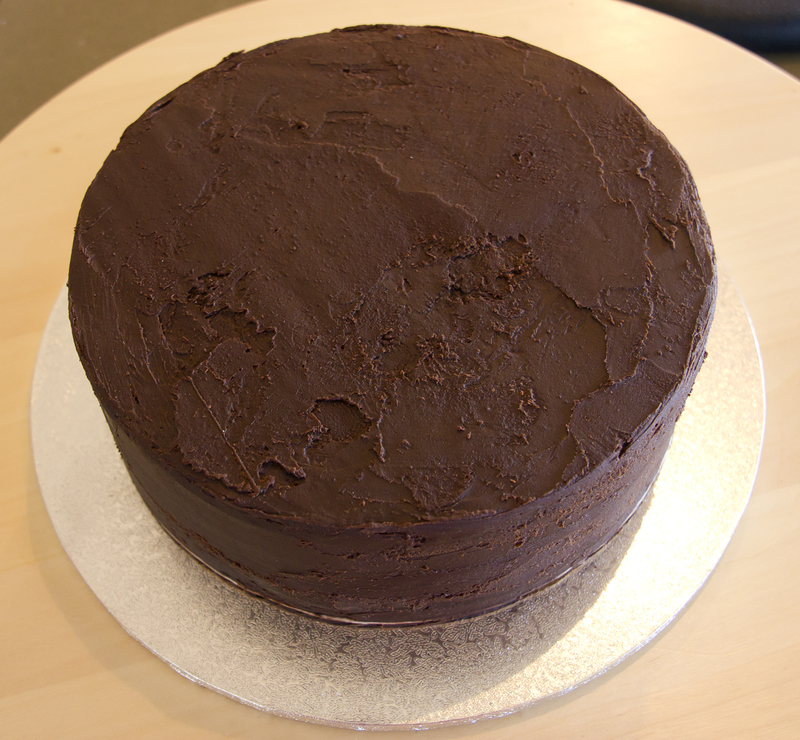 For more information on how to make ganache and cover your cake with it, please click here. Cut the cake in half and fill with ganache. Attach cake to set up board with edible glue or some Royal Icing. 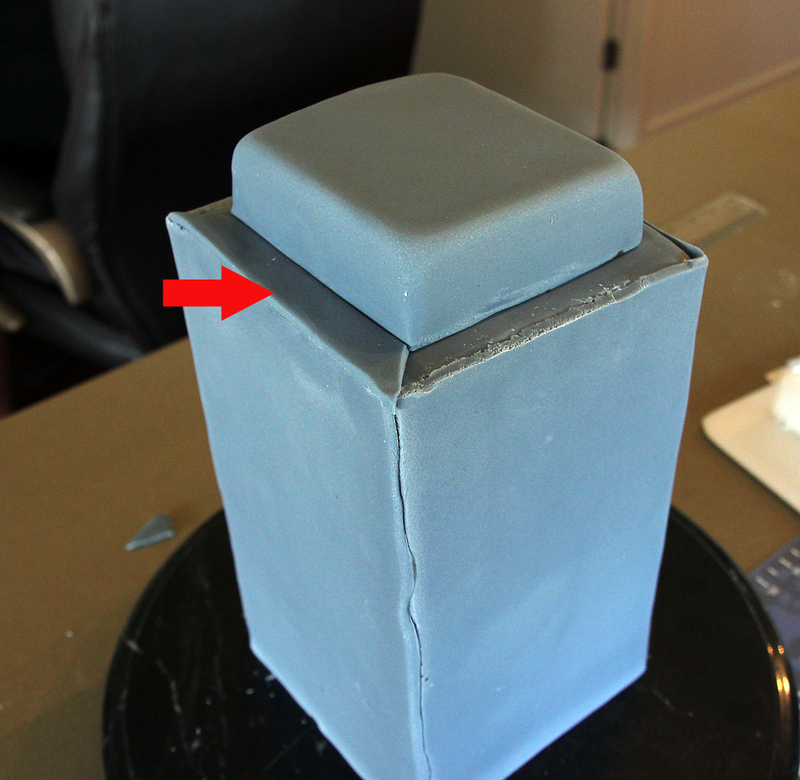 Cover the top and the sides of the cake with ganache and smooth the surfaces. 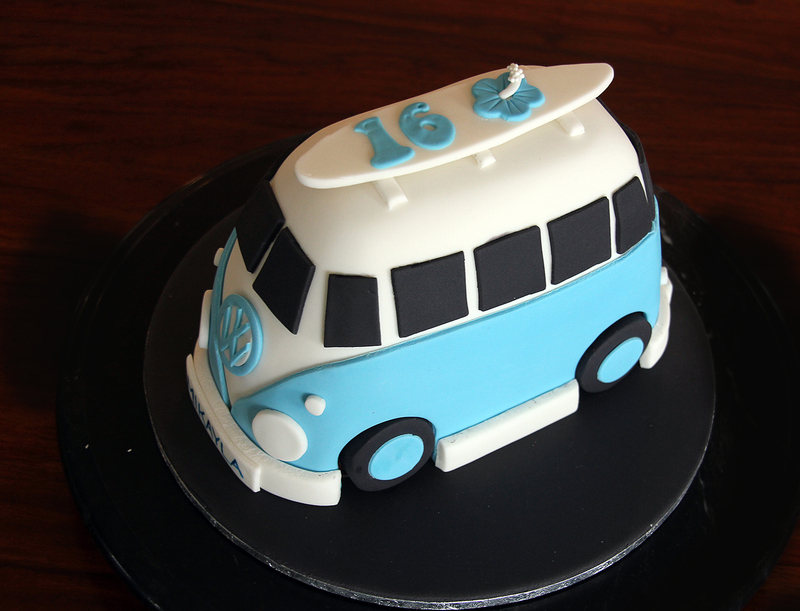 Cover cake and board in one application with Ice blue sugar-paste. Using the Template Click on the image above and save image. Enlarge or reduce the image to fit your cake. 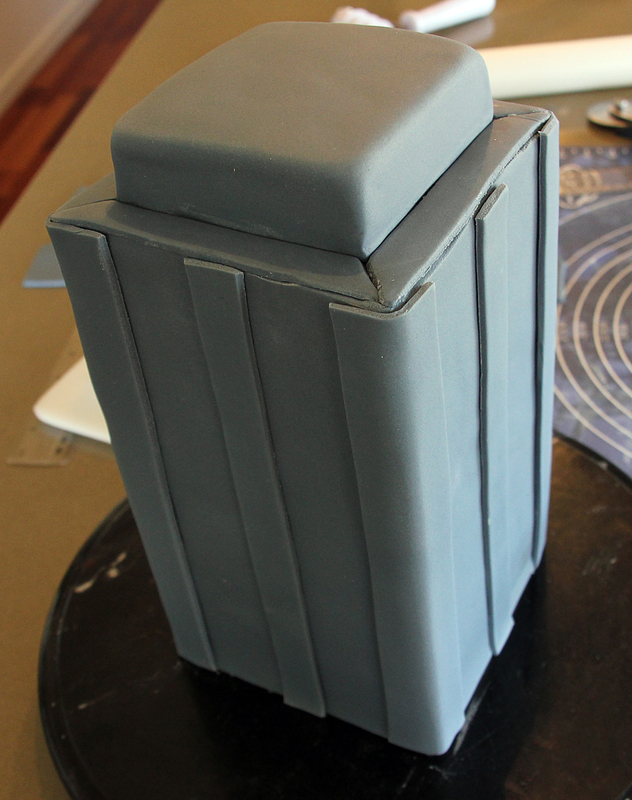 I printed it out to fit a 6.5″ circle just a little smaller than the cake. Print 2 copies so that you can keep one copy intact and the other you can cut up to make smaller templates. 1. 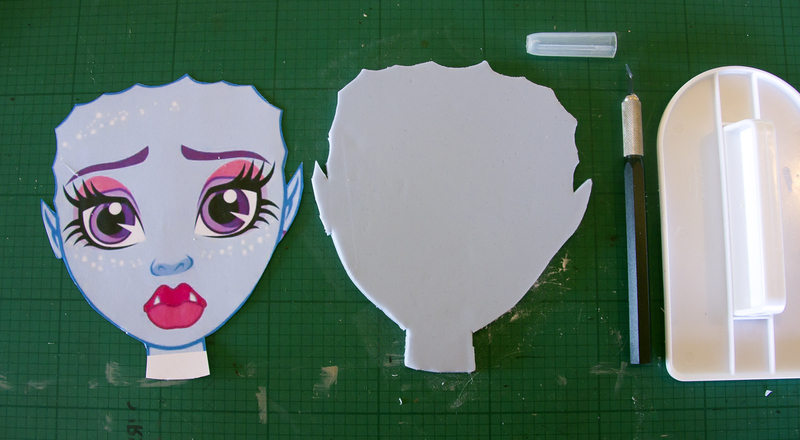 Face, ears and neck (cut out in Ice blue sugar-paste). 2. Hair and headband (cut out in white sugar-paste). 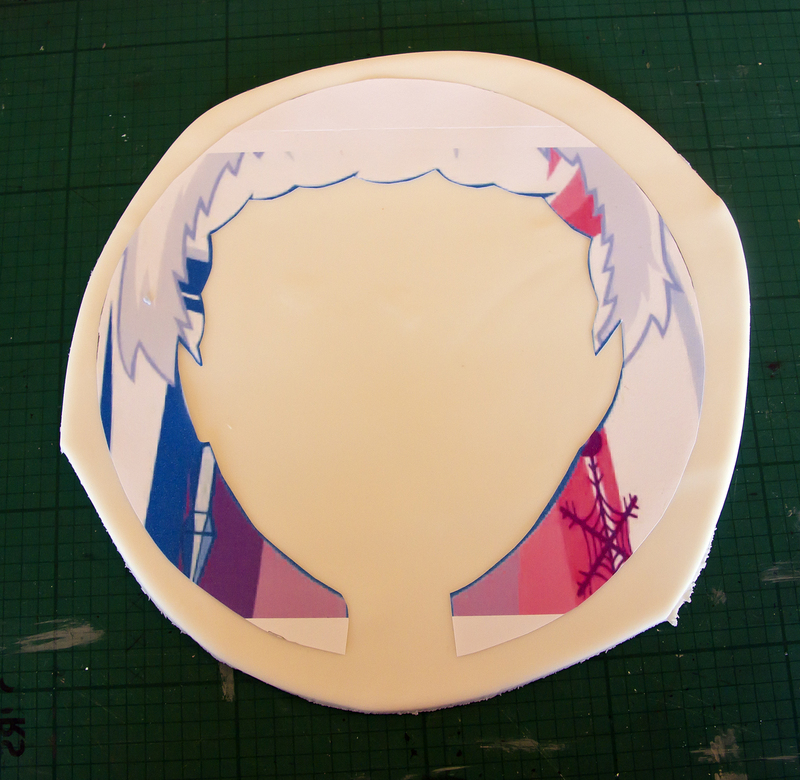 You may wish to make a little modelling paste in white and some in Ice blue for the Abbey cake topper. This will help the topper dry quichly and make it stronger. Modelling Paste 350g sugar-paste 1 teaspoon Cellogen (if using CMC, Tylose Powder or Gum Trag then use only 0.5 teaspoon) Sprinkle the powder over the sugar-paste and kneed carefully till smooth. 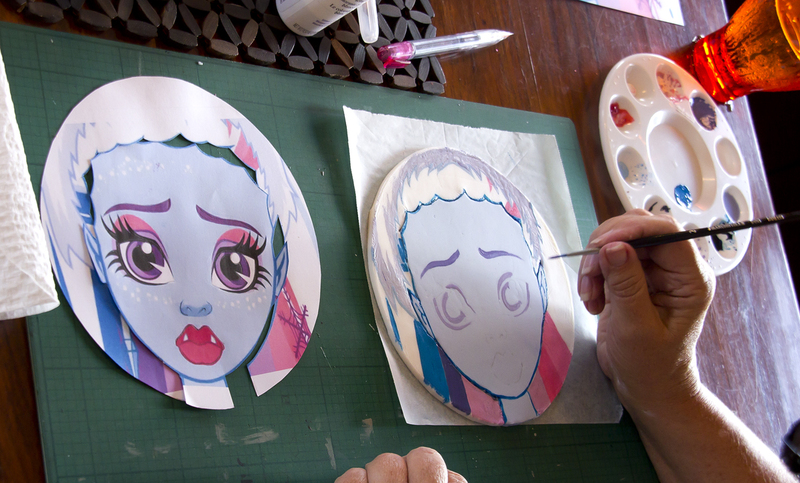 Using a few fine paintbrushes, edible gel colours and a little Vodka as a thinner start painting the hair / headband area as it is simpler and then paint in the facial features last. To help me place the eyes, nose and mouth in the right spots, I used the face template, tracing the outline of the features on the back of the template and then transferring the details onto the Ice blue sugarpaste by tracing over the outlines of the features with the template the right way up on top of the sugarpaste. You can see the fine graphite outline of the lips in the image below. I have made a video of me painting Abbey’s face and will upload it here shortly. I made this cake for Slade’s 1st birthday and his Mum didn’t want anything too scary so no skull and cross bones on this cake. 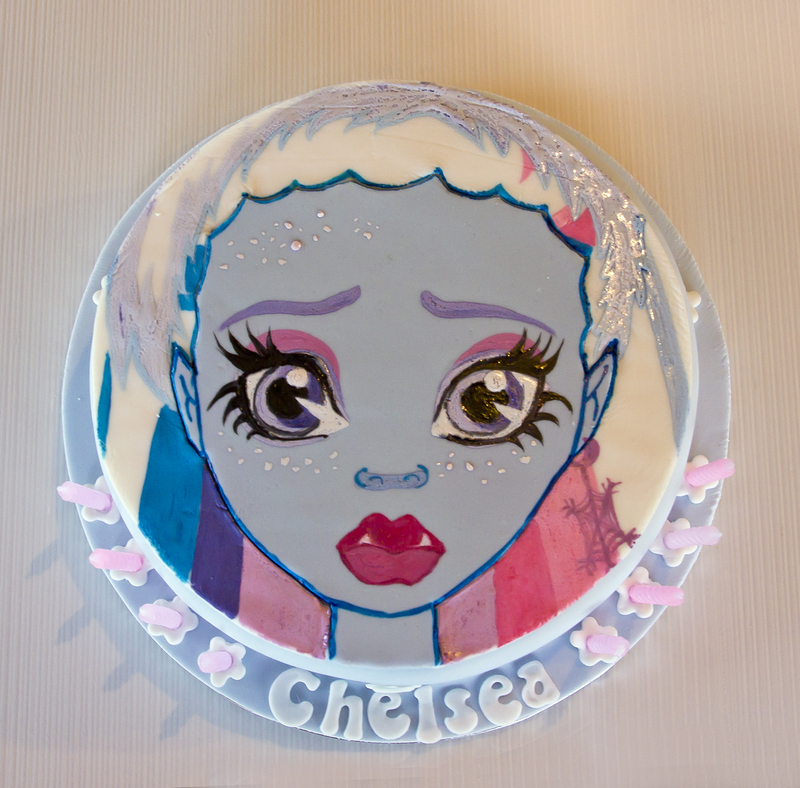 It was fun to make the cake and like many of my cakes I didn’t have any idea how it would turn out and just made decisions as to style and colour as I went along. 2. Combine chopped butter, chopped chocolate, coffee, and water in a saucepan. 3. Add caster sugar to mixture and beat well until dissolved. Add sifted flour and cocoa, lightly beaten eggs and vanilla. 5. Bake at 150C for 1.5-2 hours . Test with skewer. Cool cake in pan. 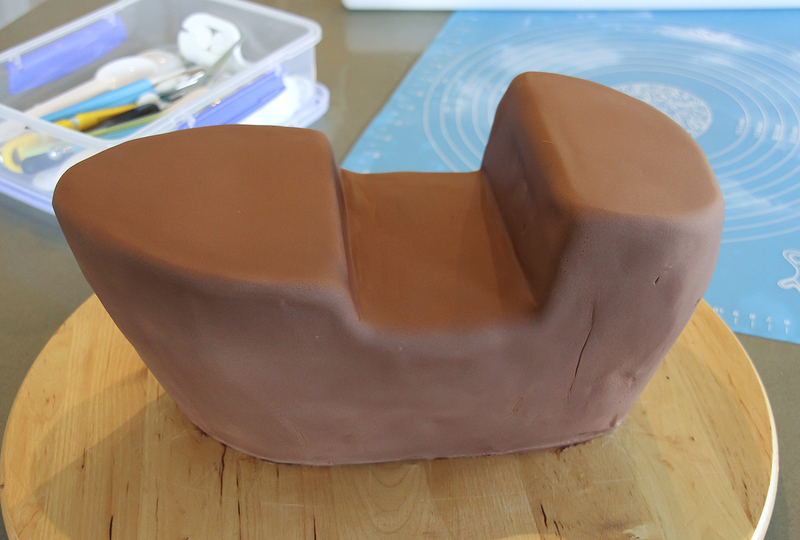 although I am asking you to make a lot of ganache, you will need a lot to give the ship its bulging shape and any extra can be frozen till your next cake project. Method: Heat the cream until it just starts to bubble, pour over chocolate (which you have blitzed in the food processor to coffee granules size) and let it sit for about a minute to melt. Use a hand whisk to blend it all together then set aside to cool. Your ganache at this point will be thin. You will have to let it set overnight until it thickens to a slightly thicker peanut butter consistency. Since I don’t have the patience to wait, I just let it cool to room temperature and then pop it in the fridge (don’t cover because you might get condensation). It would usually set in the fridge in about an hour or two. If it sets too hard, just microwave it in 10 second intervals (keep mixing it whenever you take it out) till it is easy to work with. 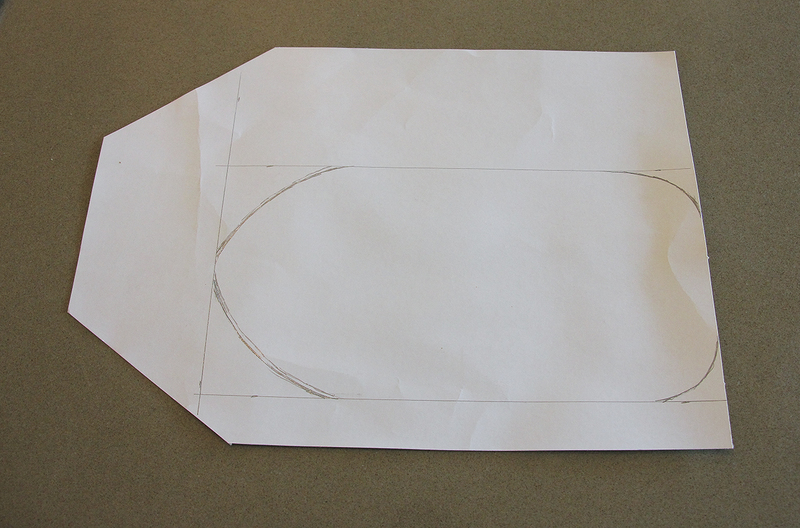 first of all measure out a rectangle 11 x 22 cm then round the corners off to make the ship template which will also be used as the set up board and the edge can be followed when ganaching..
Once you are happy with the shape cut it out. Cut the cake in half. 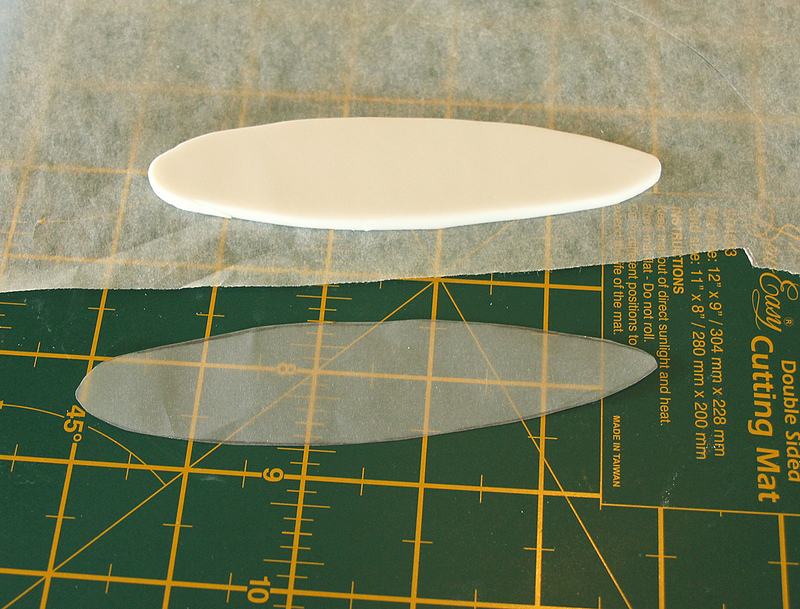 Use the template / set up board to cut out the hull shape on both halves of the cake. Now cut in half horizontally and fill with ganache. Take one piece and cut into 3 sections. 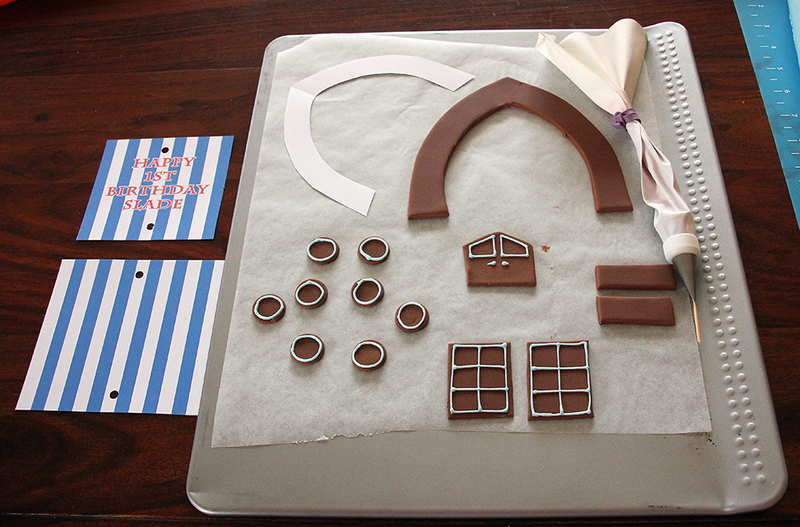 Use ganache to attach 2 of these pieces to your ship. 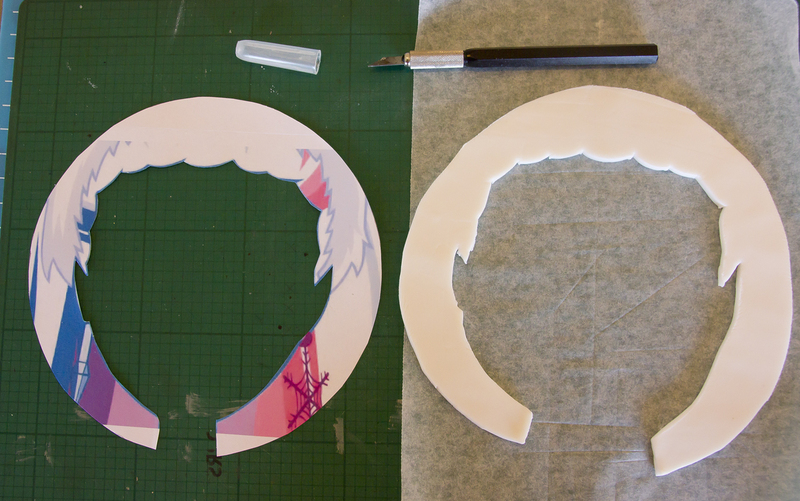 Now take the final piece and cut into 3 pieces. 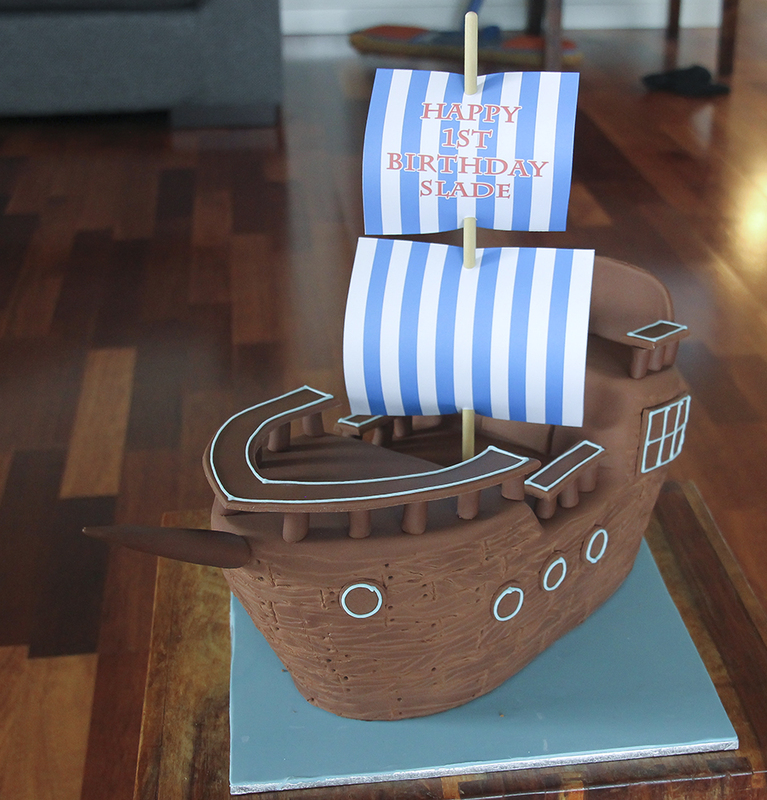 Use up all the leftover pieces of cake to create the Pirate Ship shape that pleases you the best. 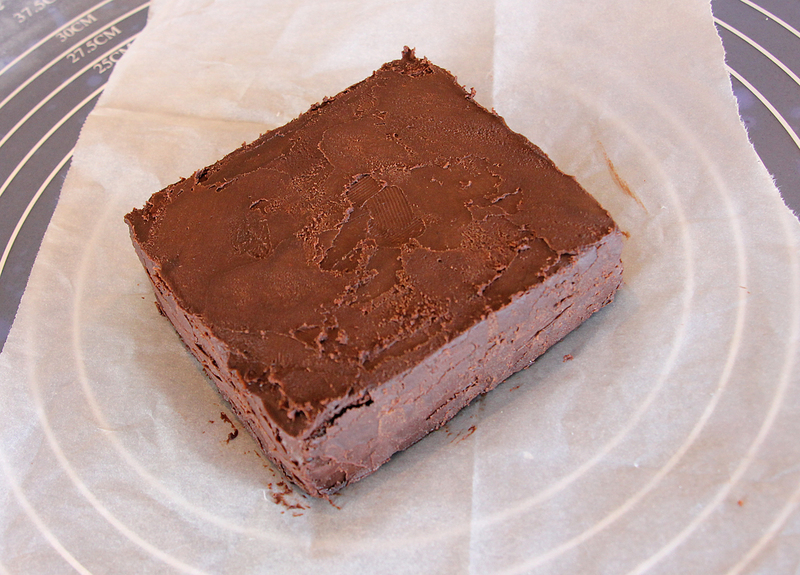 Cover with a crumb coat of ganache (a thin layer of ganache to seal in all the crumbs). Place in the fridge till it firms up. 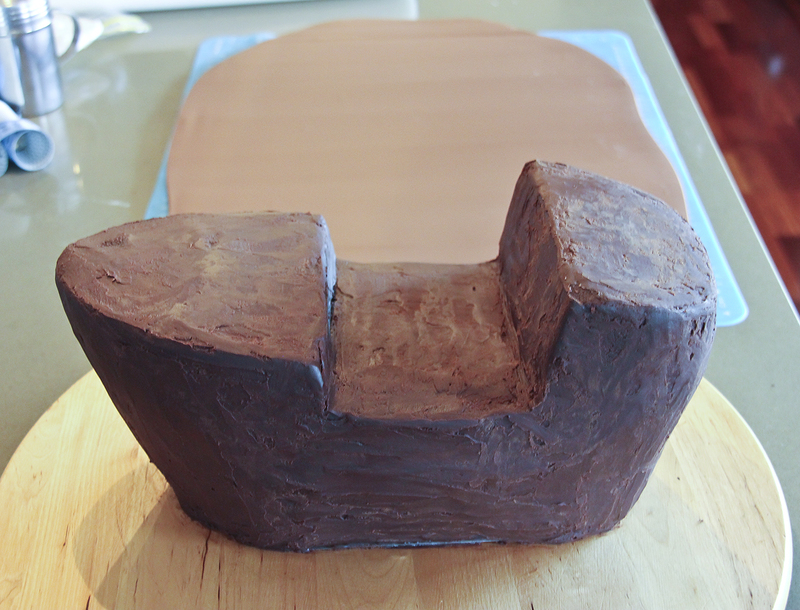 Add ganache to create final shape, making a nice rounded shape. 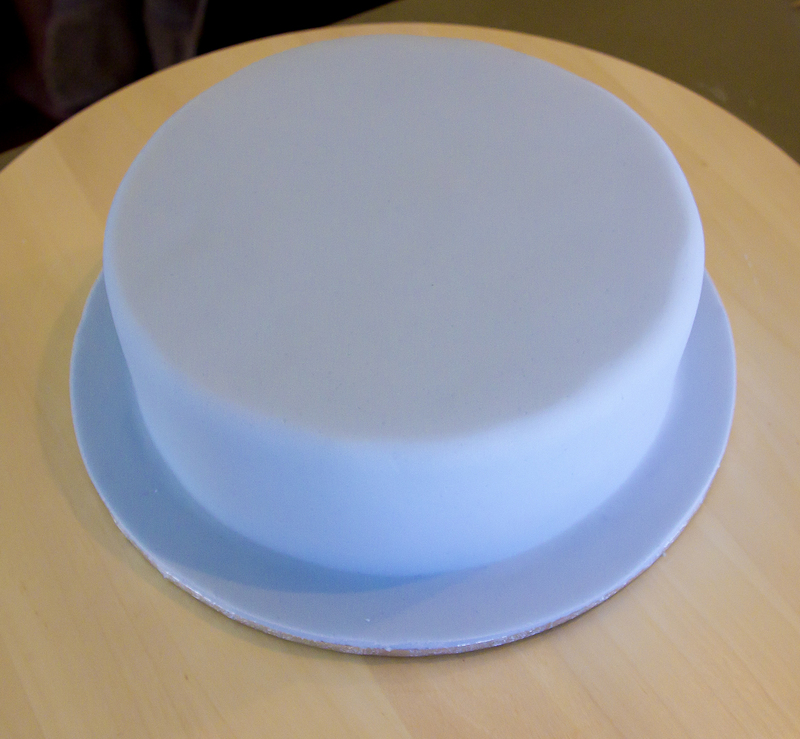 Paint a thin layer of water onto your cake board and cover with pale blue sugar paste. Measure the length and sides of your ship so you know the size of the oval piece of brown sugar paste you will need to cover your ship. 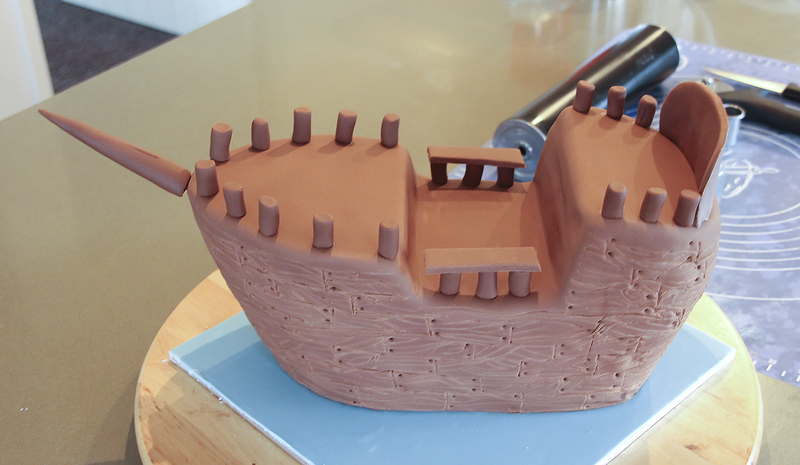 Paint a thin layer of water over the entire ship and cover with the one large piece of sugar paste. Use smoothers to smooth your sugar paste. Make marks on side of ship to resemble old wooden planks. 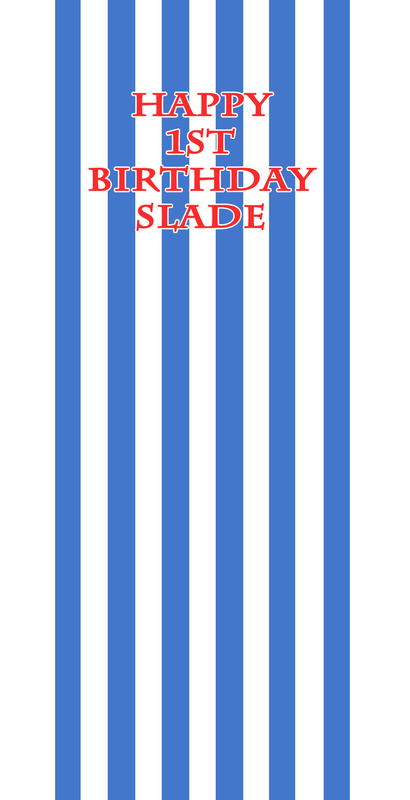 I created some stripes in Photoshop and a birthday message for Slade on lightweight card and cut out a small square with the birthday message as the top sail and a larger square as the bottom square. Use a ‘hole punch’ to make holes for the mast. 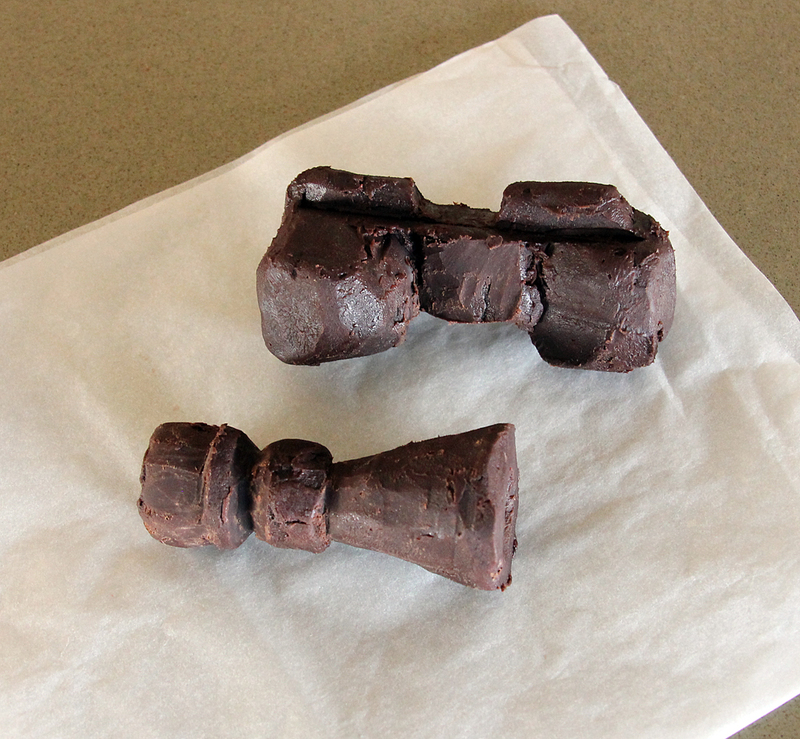 Roll out some of the left over brown sugar paste into a long thin sausage shape and cut 22 pillars of equal length. use fingers to make each one as cylindrical as possible and stick to ship with a little water, edible glue or egg white. Cut out some port holes, windows, doors and handrails. 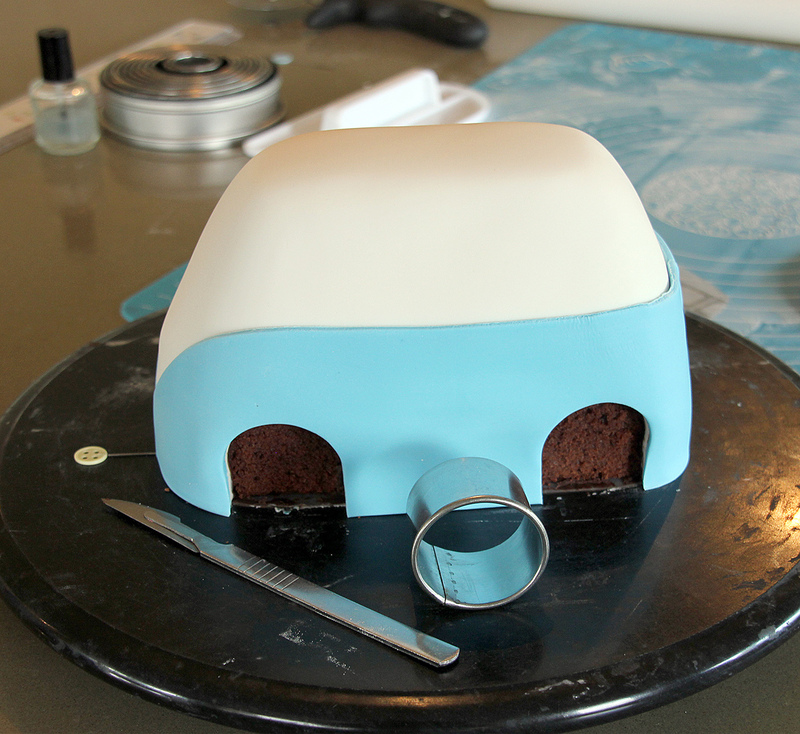 Use a piping bag to pipe some pale blue Royal Icing around the windows etc. to add interest. Leave overnight to firm up. Windows, port holes and handrails. 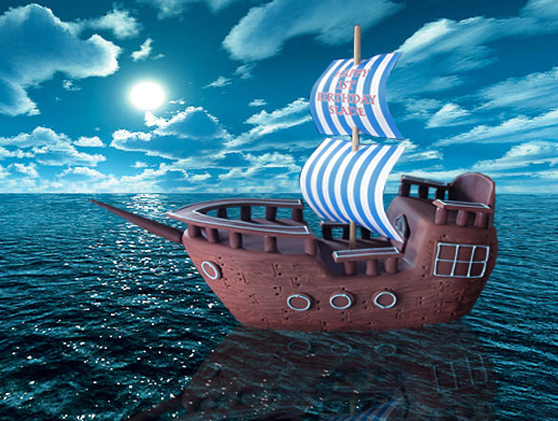 Stick all the remaining bits and bobs to the ship and set sail for the open seas. 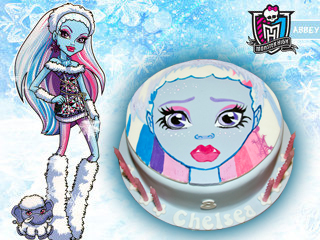 Welcome to Monster High, the place where children of famous monsters rule the school! My favorite is Draculaura, Count Dracula’s daughter! She’s the coolest ghoul in the school and I love her trendy wardrobe and her scary cute pets, too. 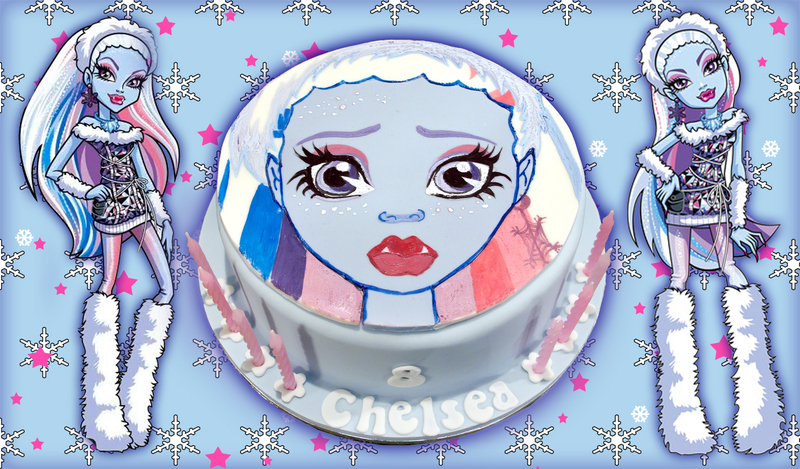 She is so popular that Amelia decided she would like a Draculaura cake on her birthday! 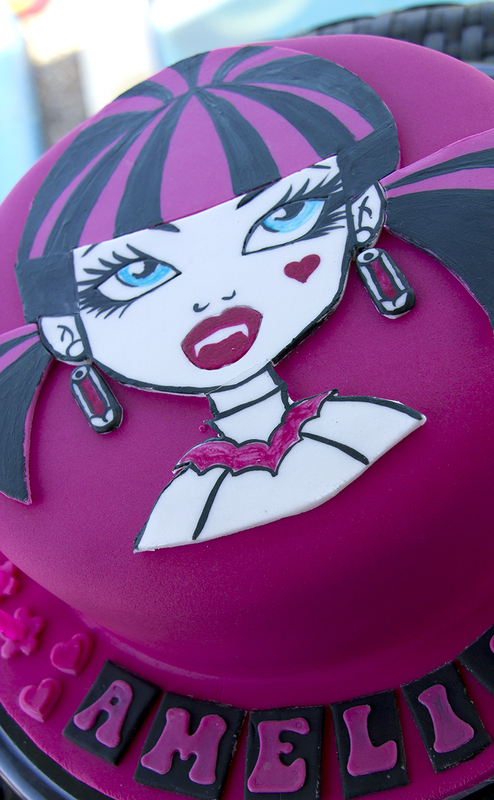 This 7″ Draculaura birthday cake is made from dark chocolate mud-cake and filled with dark chocolate ganache. Your ganache at this point will be thin. You will have to let it set overnight until it thickens to a slightly thicker peanut butter consistency. Since I don’t have the patience to wait, I just let it cool to room temperature and then pop it in the fridge (don’t cover because you might get condensation). It would usually set in the fridge in about an hour or two. If it sets too hard, just microwave it in 10 second intervals (keep mixing it whenever you take it out). Cut the cake in half and fill with ganache. Attach cake to set up board with edible glue or some Royal Icing. 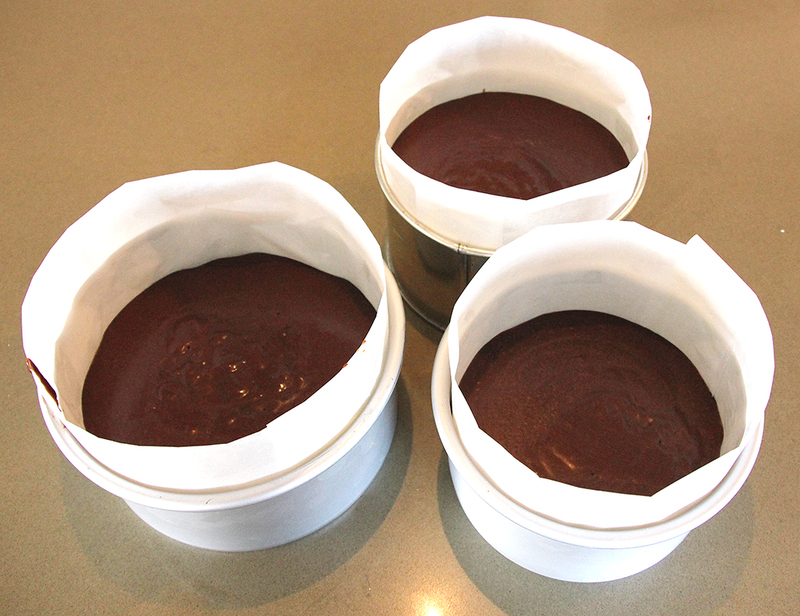 Cover the top and the sides of the cake with ganache and smooth the surfaces. She loves to splash her black outfits with some cheery pink, and even carries a frilly umbrella so she can take an occasional walk in the sun. Click on the template above and save image. Enlarge or reduce the image to fit your cake. 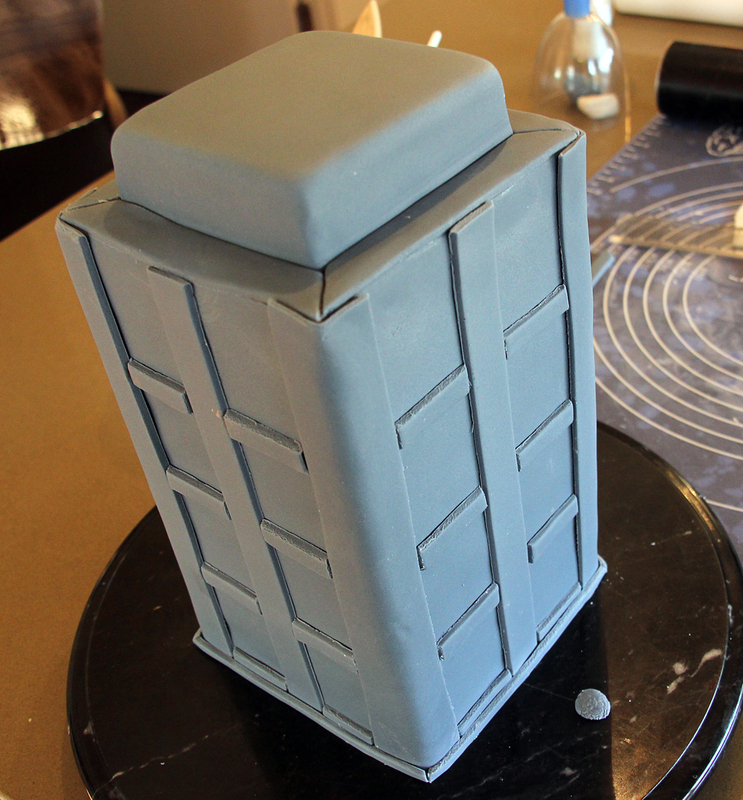 I printed it out to fit a 6.5″ circle just a little smaller than the cake. 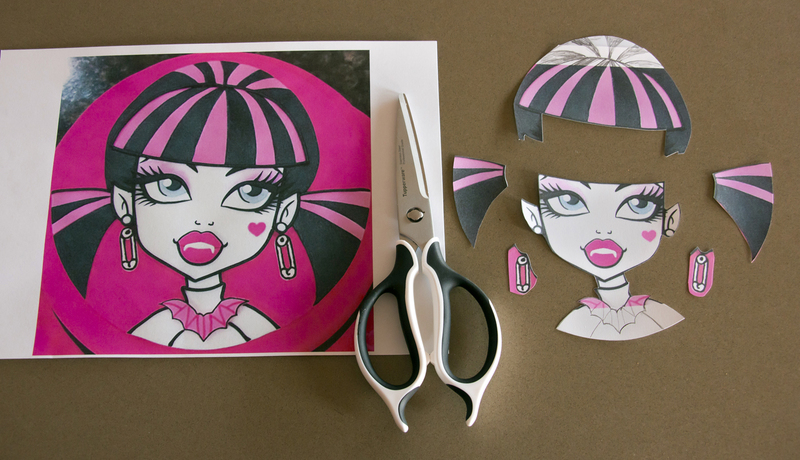 Print 2 copies so that you can keep one copy intact and the other you can cut up to make smaller templates. 1. 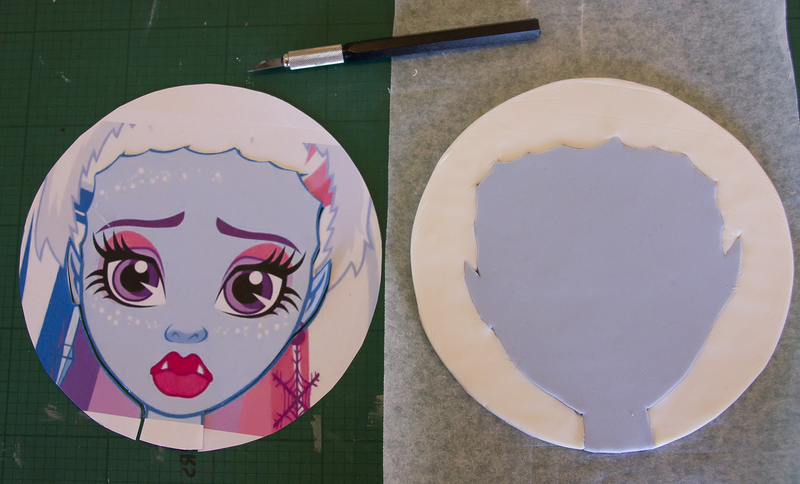 Face, ears and sholders (cut out in white sugar-paste). 2. Hair on top of head (cut out in light fuchsia sugar-paste). 3. 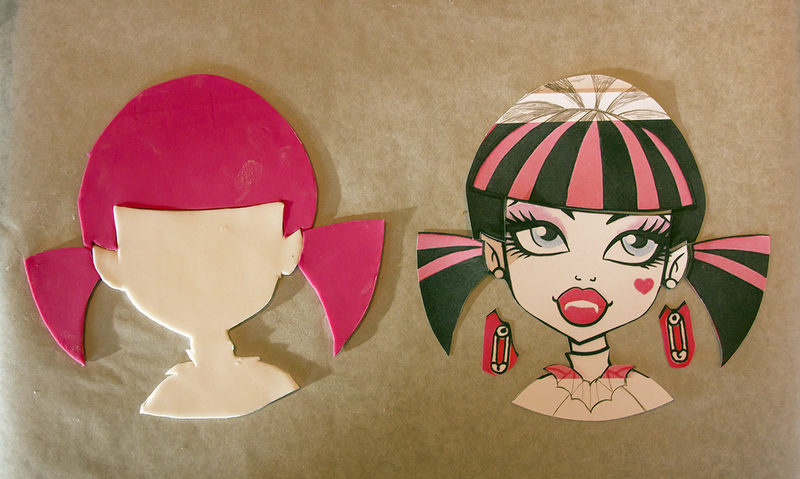 Hair bunches at side of head ( cut out in light fuchsia sugar-paste). 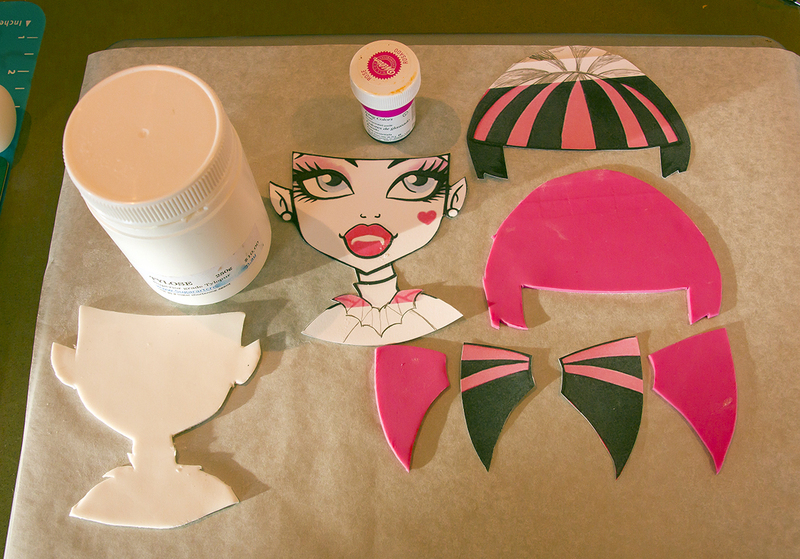 Prepare white and light fuchsia sugar paste and cut out hair, face and earrings. 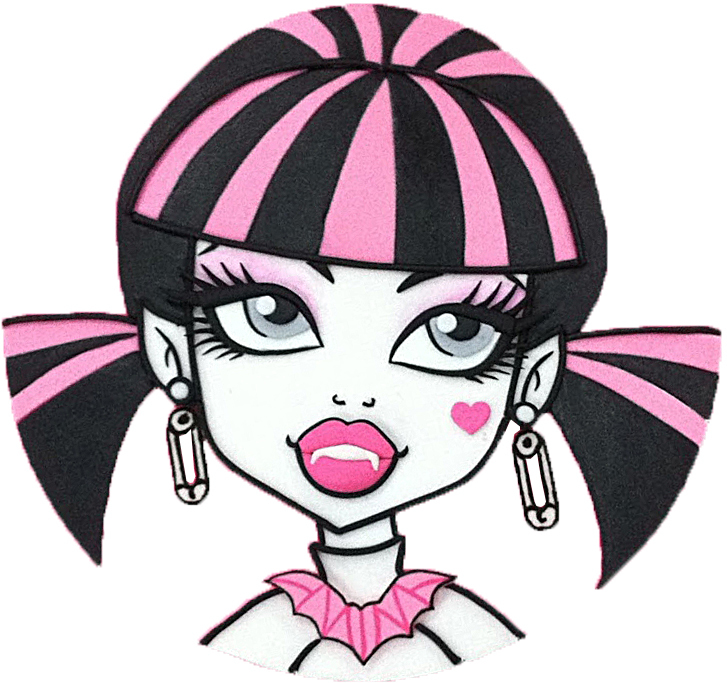 You will need to make a little modelling paste in white and some in light fuchsia for the Draculaura cake topper. This will help the topper dry quichly and make it stronger. Sprinkle the powder over the sugar-paste and kneed carefully till smooth. I used Wilton and Americolor edible gel colours which I thinned with a little Vodka. I was not sure how I was going to achieve a good result but just got stuck in with ‘paint’ and brushes. I was quite pleased with the outcome and I have put together a video of my attempt on YouTube. Unfortunately the camera was not switched on when I was painting the eyes and mouth (the important bits) but the video is still worth watching as i have speeded it up to lessen the boredom and give you a laugh. 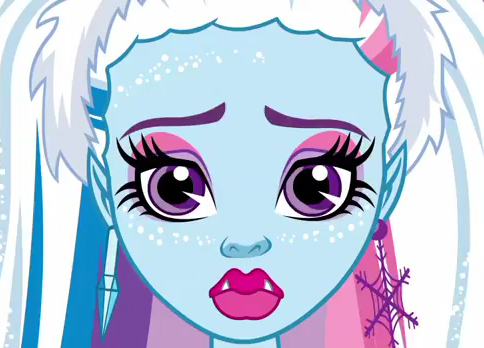 Draculaura can’t see her reflection in a mirror, she has to leave the house not knowing if her clothes and makeup are just right. Of course, after 1,600 years of practice she’s gotten pretty good at it. Draculaura is a vegan. No icky blood for her, so it’s fruits, vegetables and a lot of iron supplements. 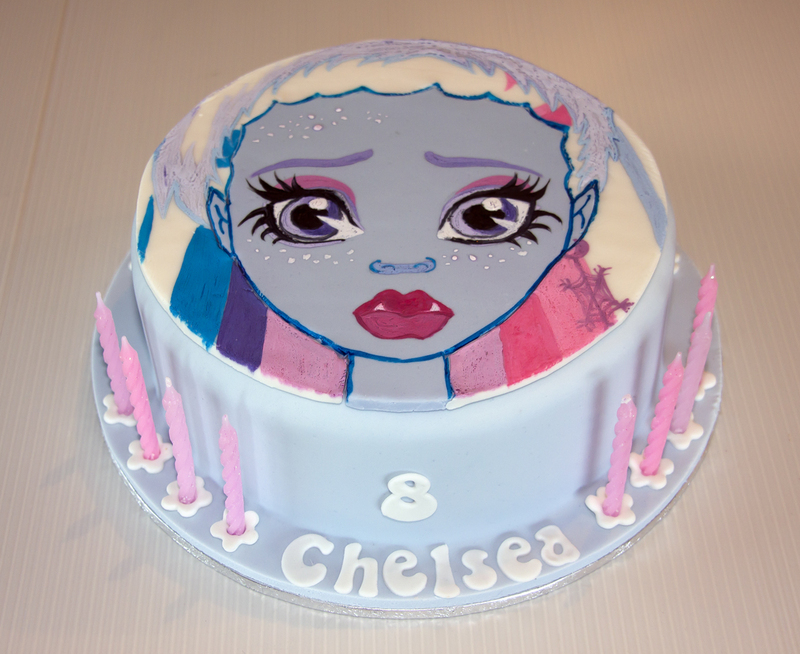 This cake does not require any sugar paste which is excellent news for children who dislike sugar paste or the decorator who dislikes using sugar paste. 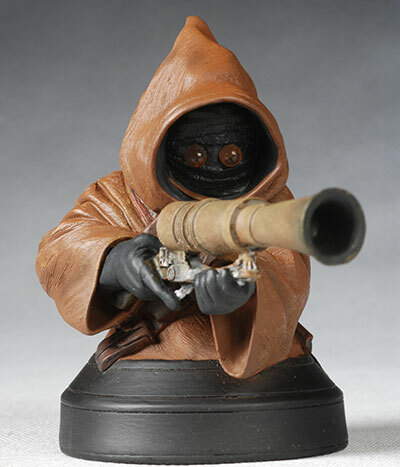 The Chocolate ganache finish is a little rustic but suits our cheeky little Jawa well. 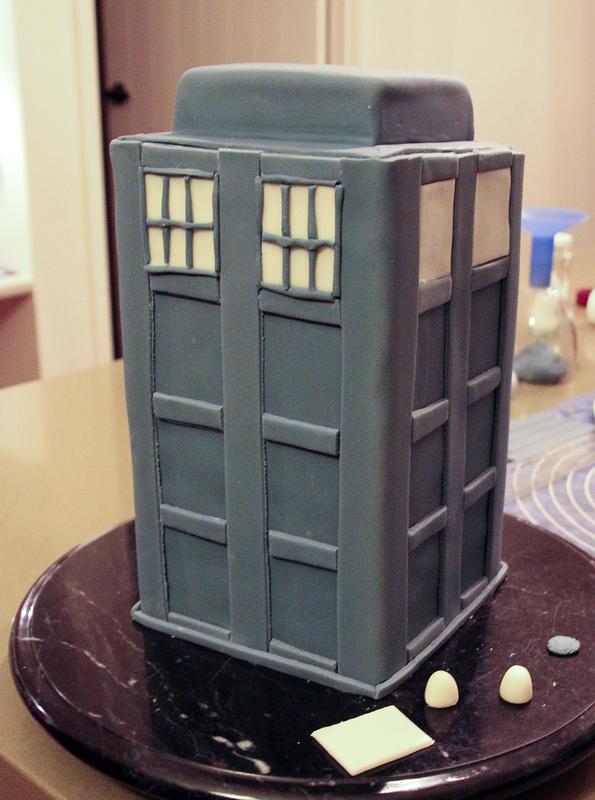 There are no real instructions for sculpting this cake as I mostly used my fingers and a small pallette knife. The chocolate ganache behaves a bit like clay and when it gets a bit soft you just pop it in the fridge to firm up again. 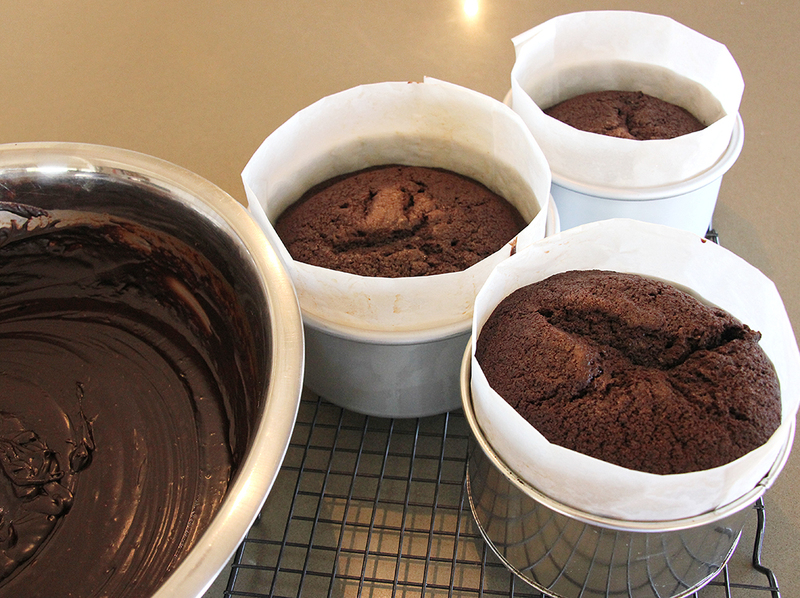 Ingredients for Chocolate Mud Cake I used 3 round cake pans 5″, 5.5″ and a 6″. The eyes are two yellow sweets (lollies) with a sugar coating. Grease and line base and sides of the bowls with one thickness of baking paper, bringing paper 5cm above side of pan. Combine chopped butter, chopped chocolate, coffee, and water in a saucepan. Stir over low heat until chocolate is melted. Cool 15 minutes. Transfer mixture to bowl of large mixer. Add caster sugar to mixture and beat well until dissolved. Add sifted flour and cocoa, lightly beaten eggs and vanilla. Pour mixture into prepared bowls. Bake at 150C for 1 hours. Test with skewer. Cool cakes in their pans. 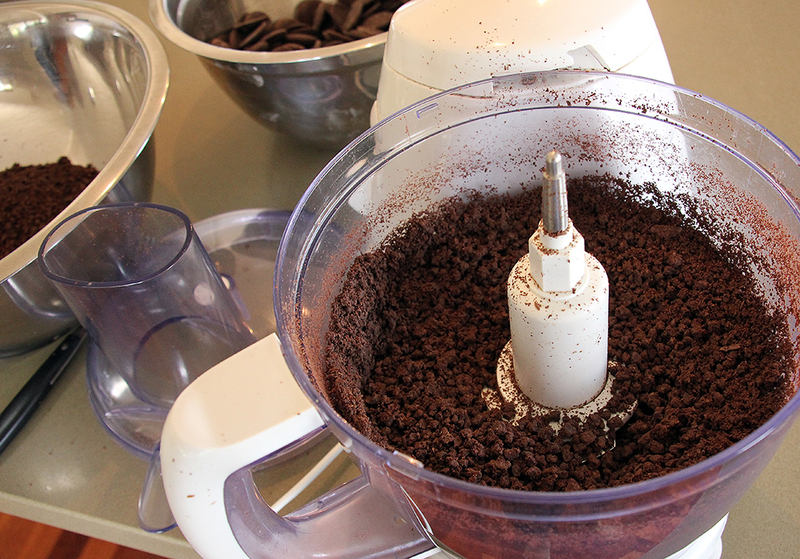 Place pieces of chocolate in food processor and process till chocolate looks like coffee granules. Allow to cool completely and then leave to set overnight. (Sorry that I have no pictures for this part, I must have been so caught up in my work that I forgot to use my camera!) I cut all 3 cakes through the middle and filled them with ganache. 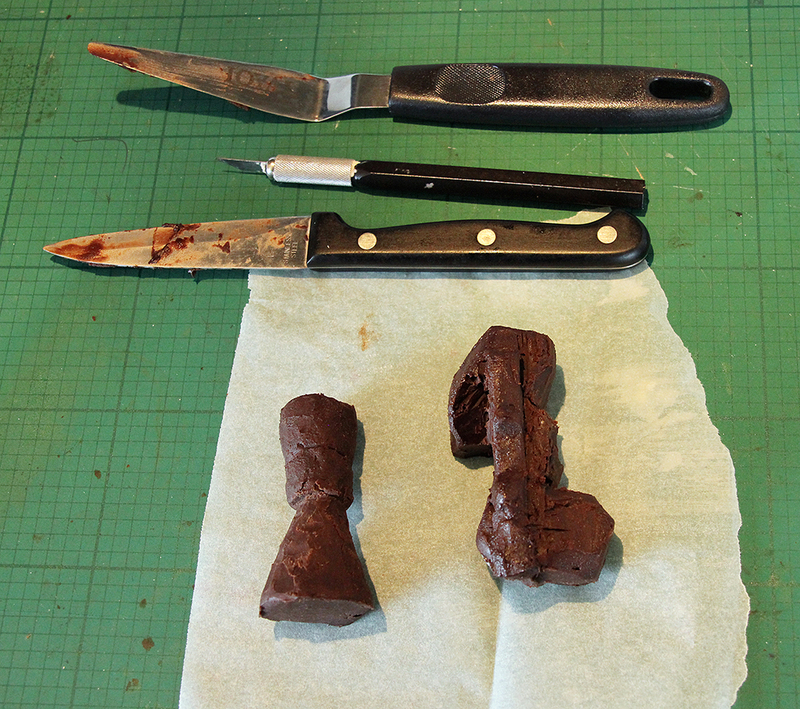 I started with the smallest cake and shaped it roughly into a head shape, covered it in ganache roughly and put it in the fridge to harden a bit. Then I stacked the two largest cakes one on top of the other with the largest at the bottom. I inserted a wooden dowel down through the middle of the cake with a portion left sticking up through with a point on the end so that I could slide the head on. I used ganache to help stick the head to the body. 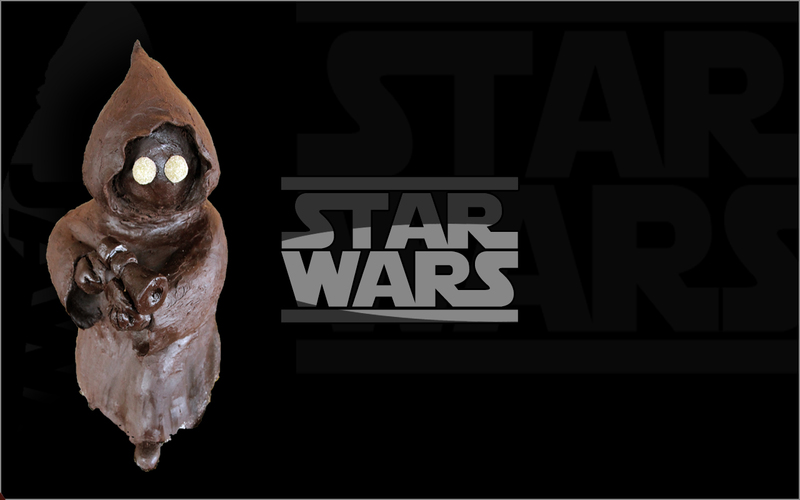 I used the pieces of cut off cake ( I mixed the cake with some ganache to make it easy to mould) to help mould the Jawa shape e.g. his knee and foot but not his arms at this stage. Place in the fridge to firm up again. 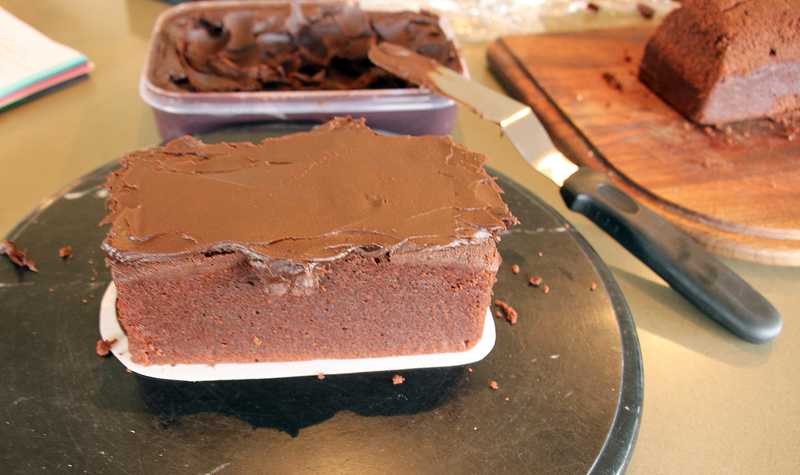 Cover all exposed areas of cake with a thin layer of ganache (crumb coat) Place in fridge to firm up. 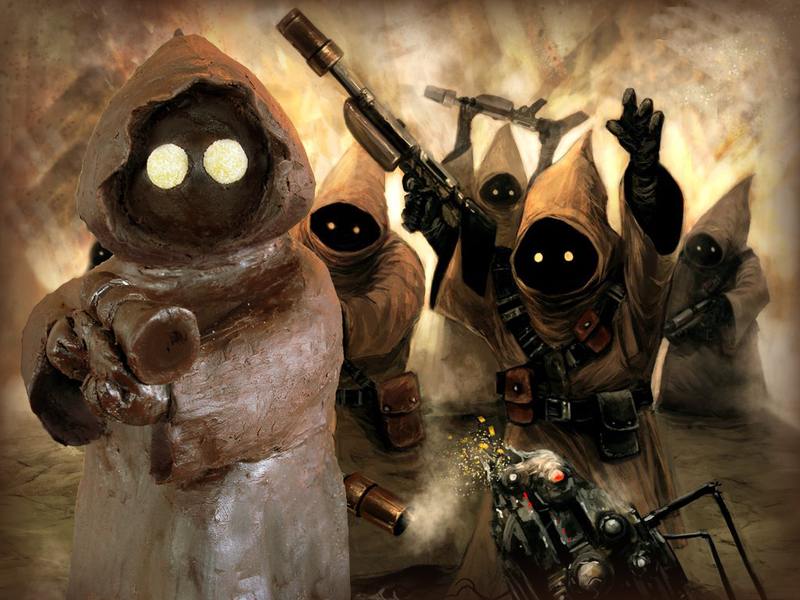 I used this image as inspiration for my cake. To build up the arms I used a few cocktail sticks and layered the ganache slowly adding to the size and shape while still popping the cake in the fridge to firm up each stage before continuing. I had a few saggy moments but that only made me more careful and determined to make it work. I made the gun in the same way and added it at the very end with the help of 2 toothpicks. I enjoyed mouling the shape with my hands and although it looks like s..t to begin with it soon starts to take shape and creating the hood and sleeves is just magic! I added some raw caster sugar at the base to look like sand. Click on the images below to go straight to the corresponding tutorial. 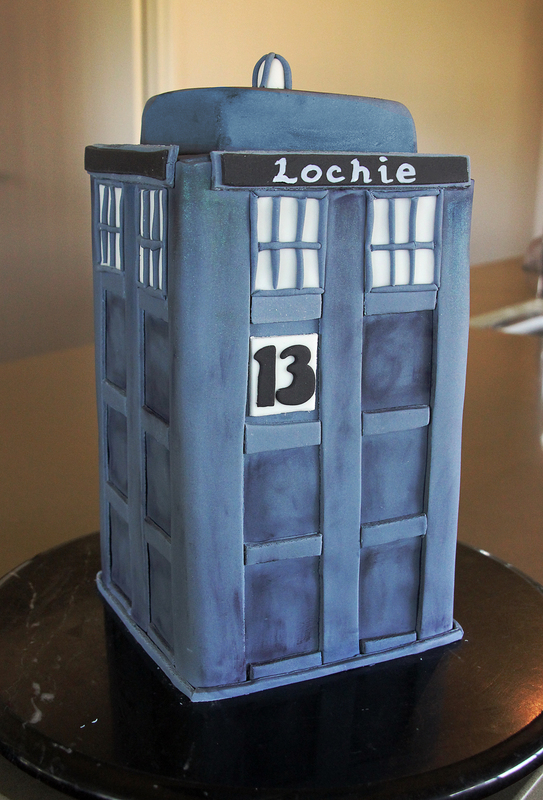 A Tardis cake for Lochie on his 13th birthday. 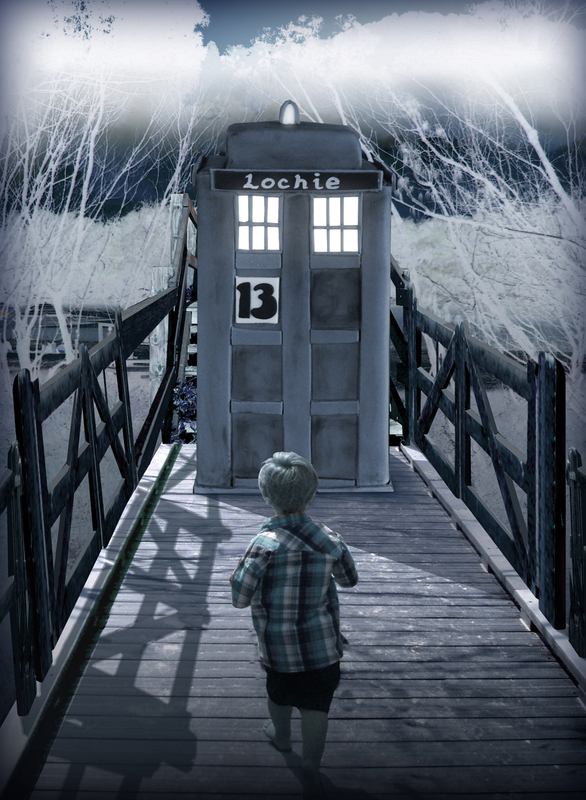 He is a big Dr Who fan! 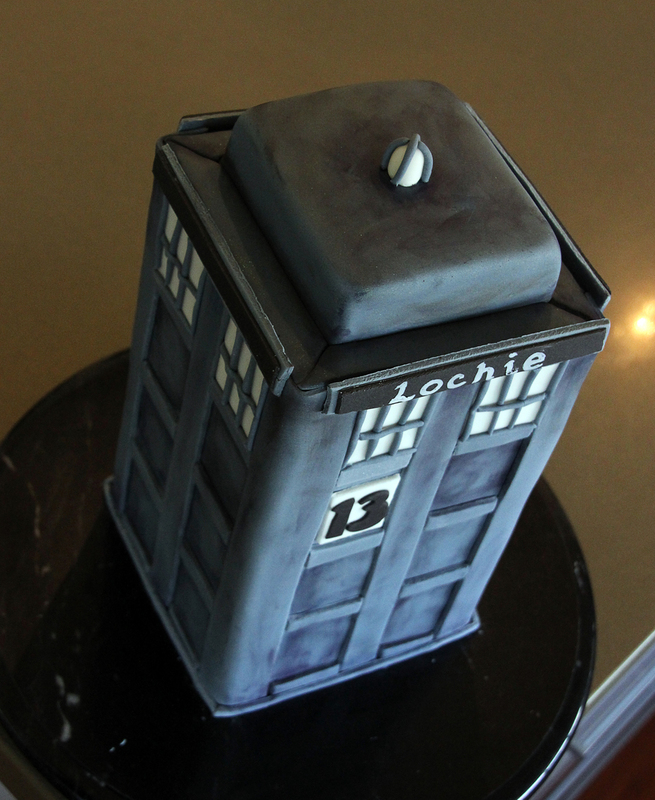 The Tardis cake was on a black marble turntable and we hid it in the media room (no windows). 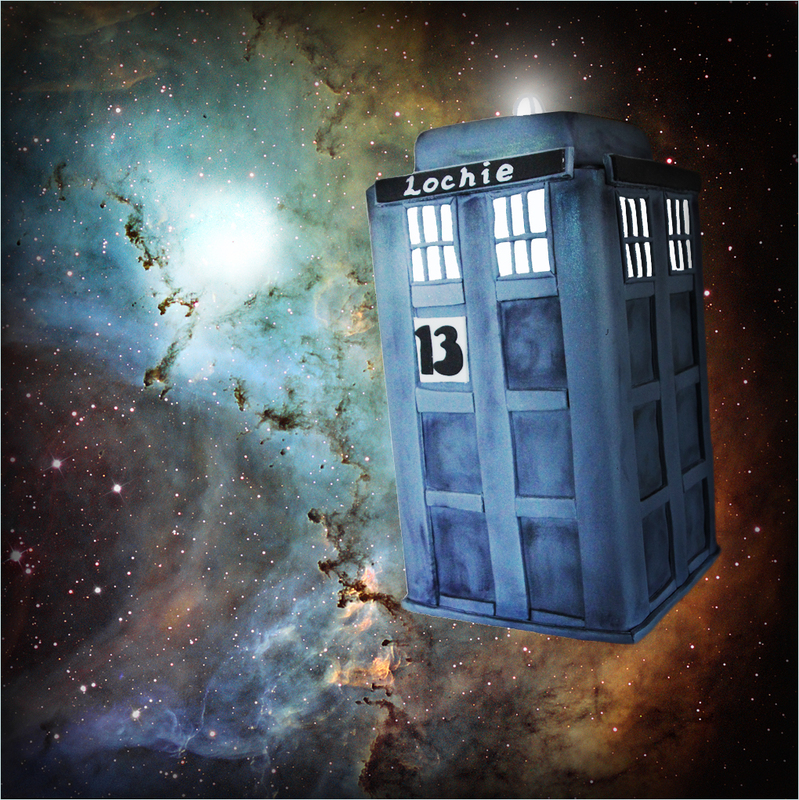 Lochie was brought into the darkened room and someone swirled the cake around at speed while another person moved their hand rapidly up and down in front of a torch, creating a strobe effect while a third person (Alasdair) played the Dr Who TV theme tune on the laptop. All of this went down really well! This cake was another of my dark chocolate mud cakes with dark chocolate ganache filling as all children seem to love it and adults too. The cake is quite straightforward and the instructions are easy to follow. It did, however, take longer to make than I anticipated so leave some extra time for the finishing touches. 2 x 4″ set up boards. 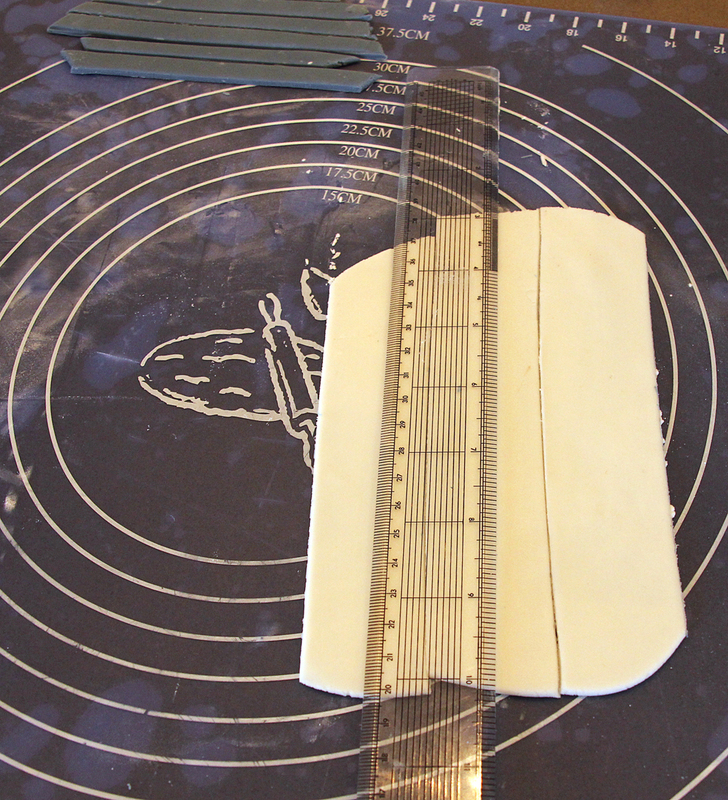 These boards will be used to separate the top and bottom parts of the cake. Small amounts of black and white sugar paste for windows, signs etc. I used an 8″ square pan for the cake but I used the recipe for a 9″ square cake so that my cake would be taller than normal. 5. Bake at 150C for 1 to 1-1/2 hours. Test with skewer. Cool cake in pan. 2. Put the cream in a saucepan and bring to the boil. Pour the cream over the chopped chocolate and mix with a whisk until the ganache is smooth. 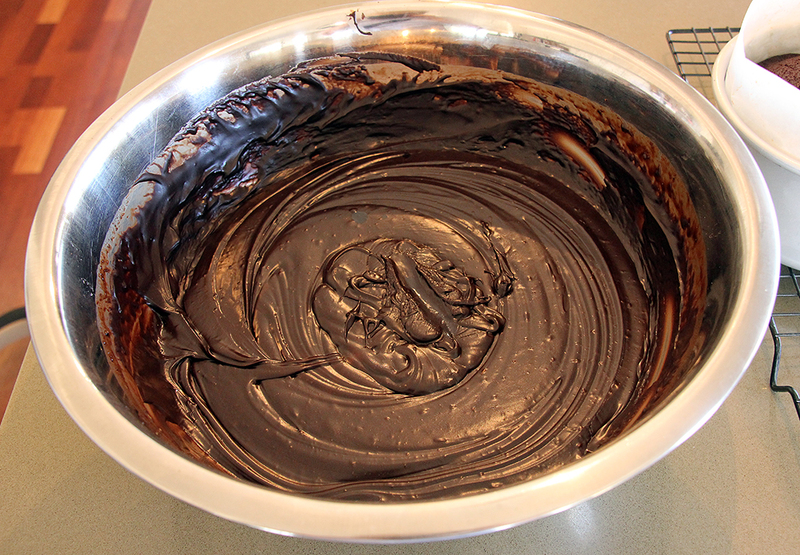 Do not use an electric whisk as you will create too many air bubbles in the ganache. 3. Allow to cool completely and then leave to set overnight. 1. 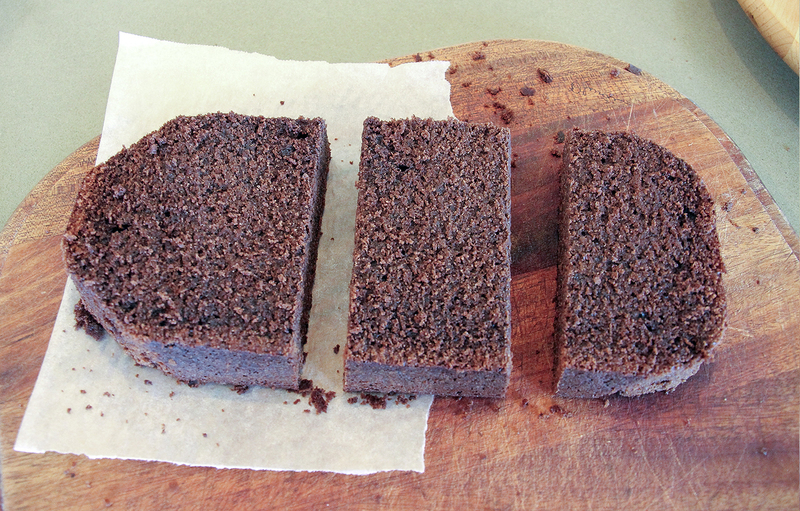 Cut your cake into 4 small cakes, each 4″ x 4″. 2. Now cut each of these horizontally, giving you 8 pieces. 3. Make two cakes. 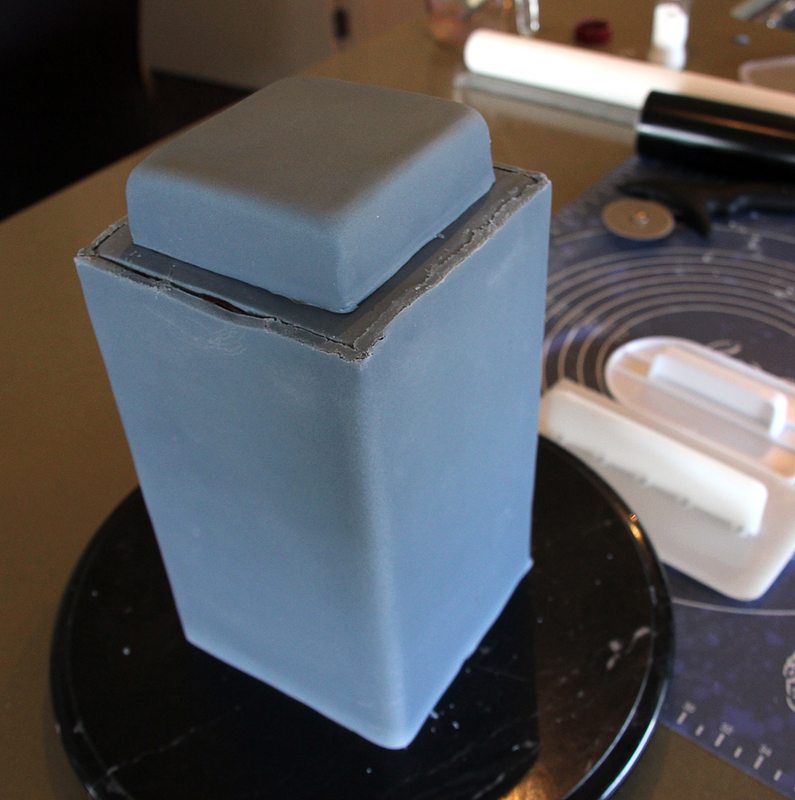 The bottom cake will require 4 pieces filled with ganache sitting on the 4.5″ set up board. Also cover the top and sides with a thin crumb coat of ganache. 4. The top half is made up of 3 pieces sitting on the smaller 4″ set up board. Fill with ganache and again cover with a thin crumb coat of ganache. 5. 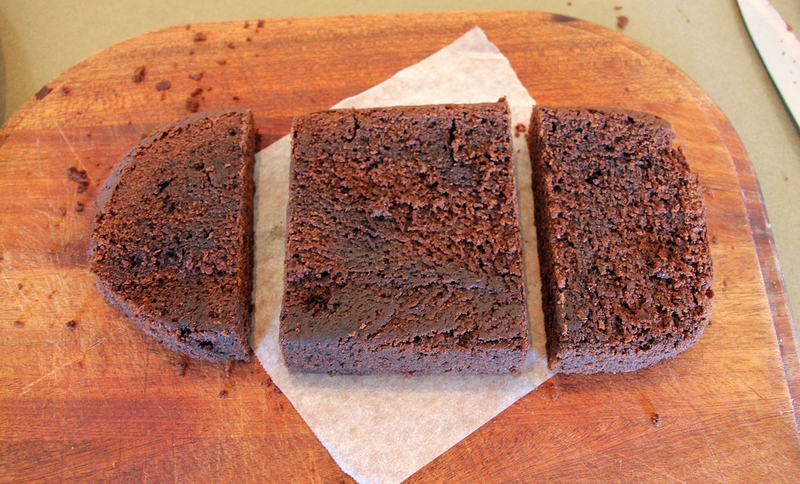 Place the remaining 4″ board upside down on top of your bottom cake then place the top cake on top of this. 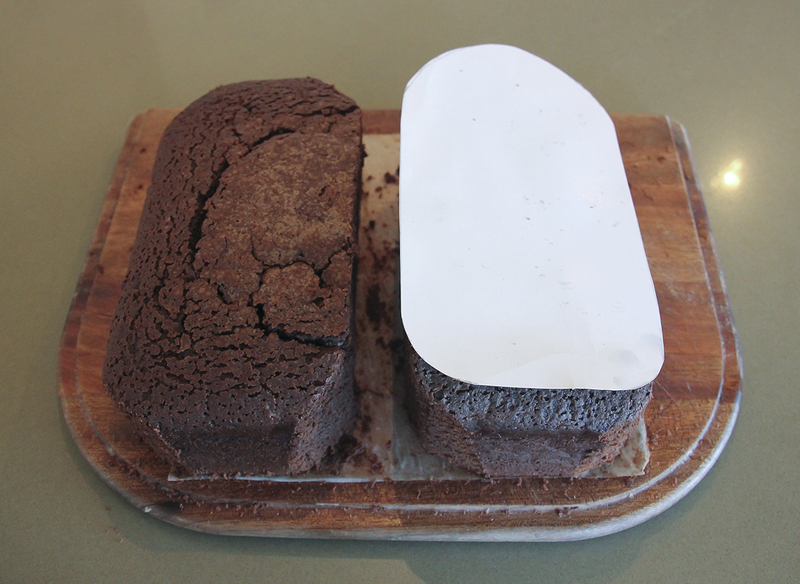 Where the two cakes meet can eventually be separated when you cone to cut the cake. 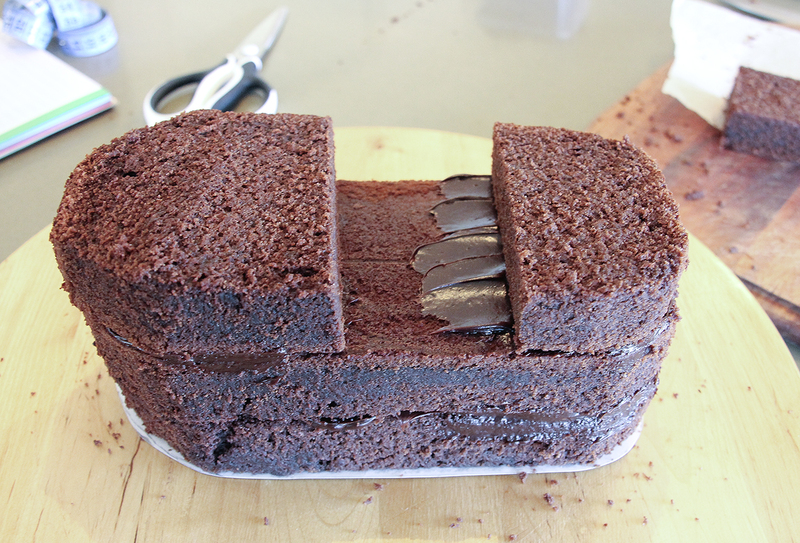 This will make it easy to cut elegant slices of cake. 6. Wait until your ganached cake firms up. You may need to put it in the fridge for half an hour. 6. You should now have one remaining 4.5″ board. Place it on top of the cake and use it as a guide to help you ganache the sides of the cake. 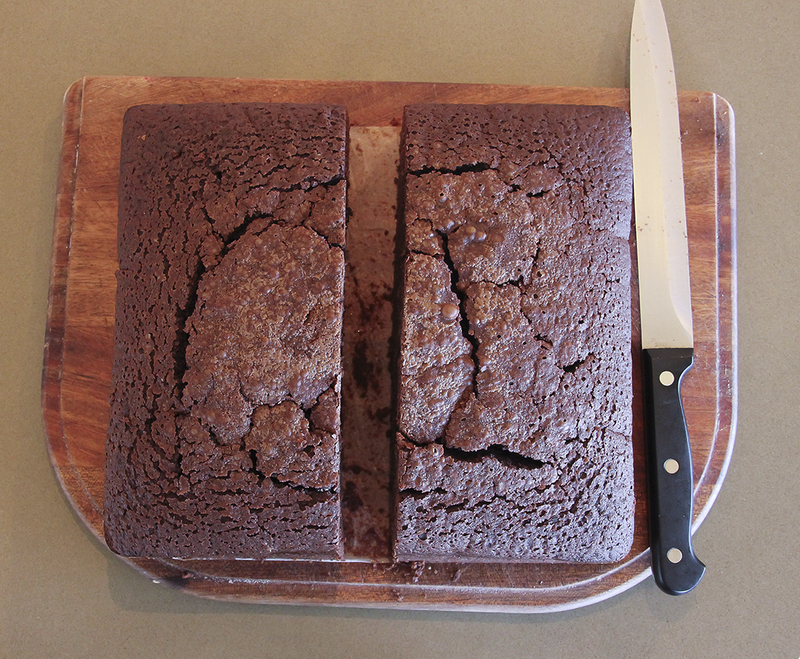 If you use a set square you can run it along the sides of the cake using the 4.5″ boards at the top and bottom as a guide. Easy! 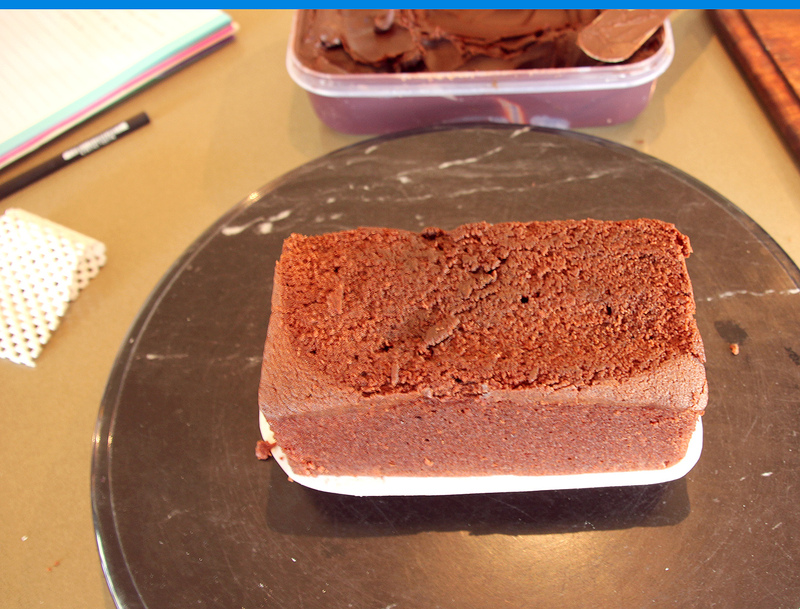 The final cake slice will be used as the roof so cut the sides off to make it a little smaller and cover it with ganache. 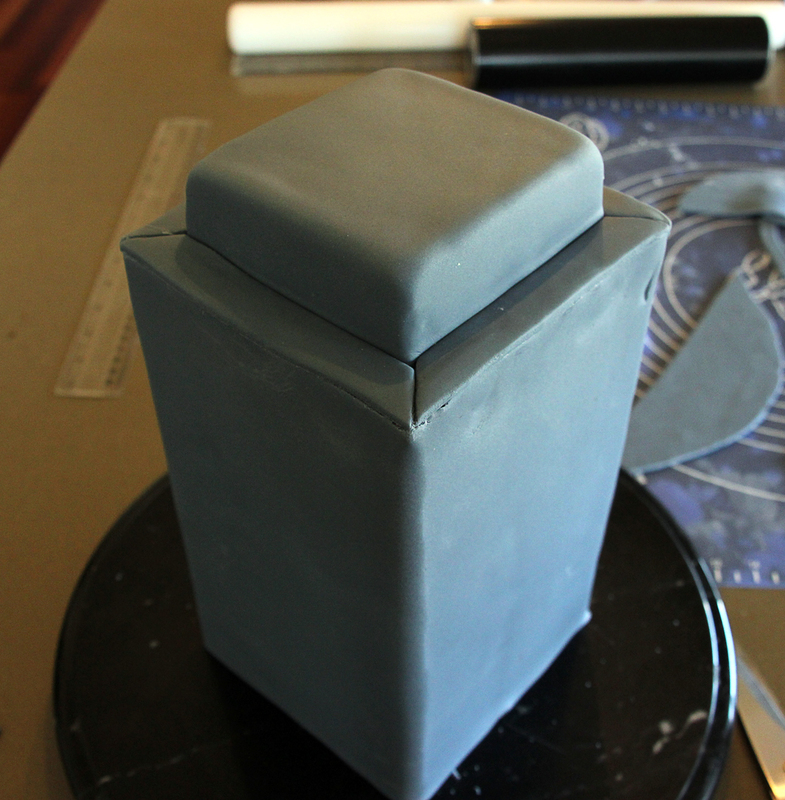 You can cover it with blue/grey sugar paste as soon as the ganache forms up. 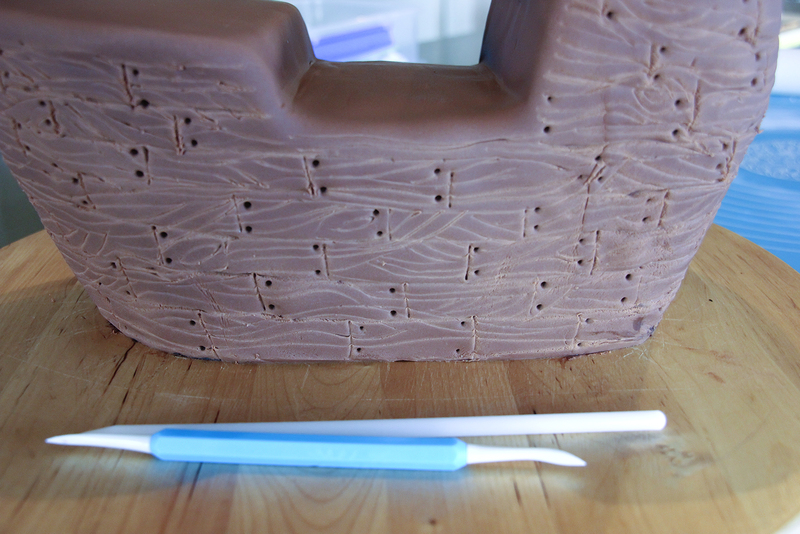 To cover in sugar paste, use a brush to apply a thin layer of water onto the ganache. Make a lid and attach. 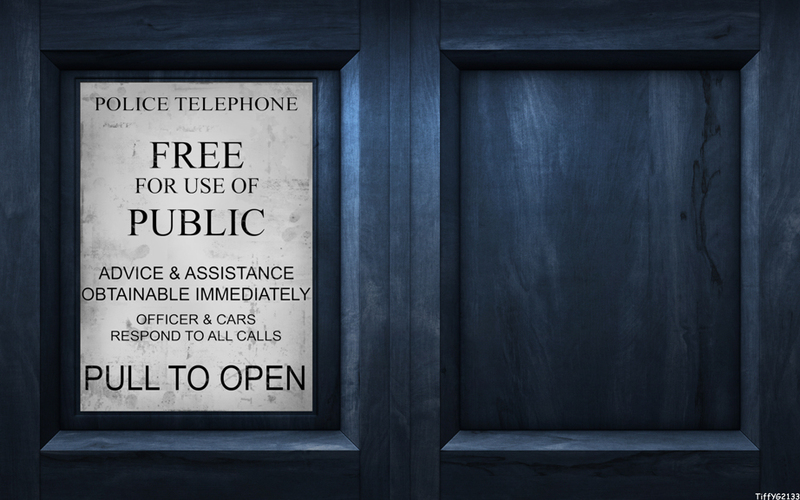 Measure the the height of the Tardis and the perimeter. Cut out the sugar paste a little larger and wrap around. Trim off the excess. The rough join is unimportant as corner pieces will eventually cover it. Attach the roof with a thin layer of water. Add 4 thin pieces of sugar paste to neaten up the roof. Cutting out the corners using the width of the ruler as the width of the sugar paste. 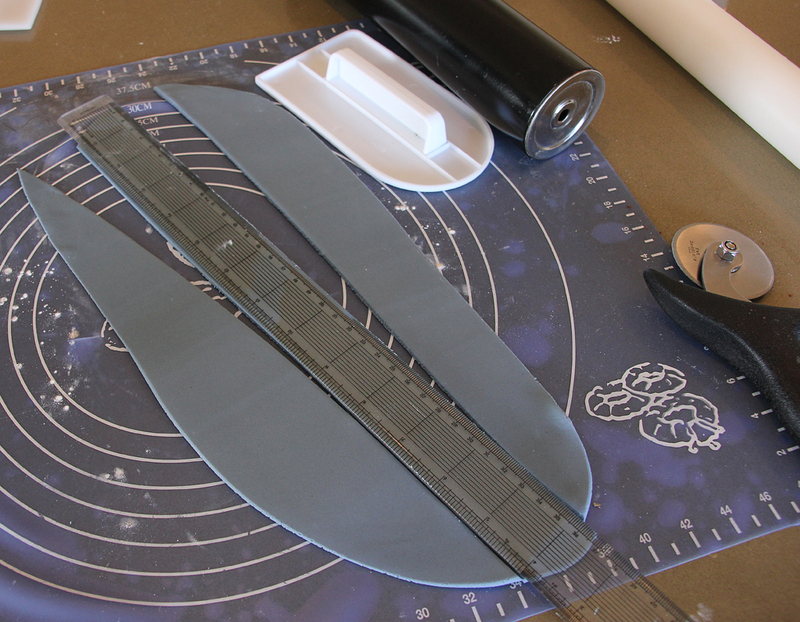 Cutting slimmer strips to attach to the centre of each side. Paint on a little water to help each piece stick. Cutting out the windows. I used the width of my ruler as a guide but had to cut a little more off each to make a snug fit. 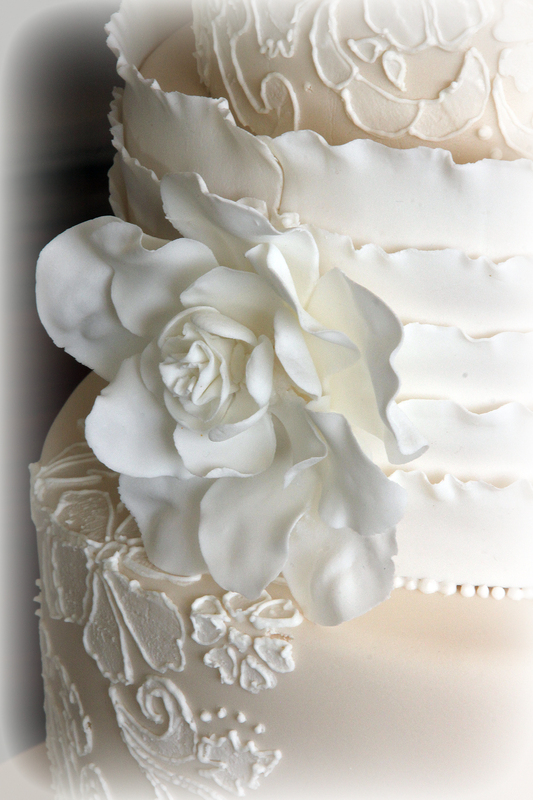 Use a dry paint brush to apply the dark blue petal dust to your cake. Use it to darken the shadows and to make the overall look distressed. This photomanipulation is made up of several images. 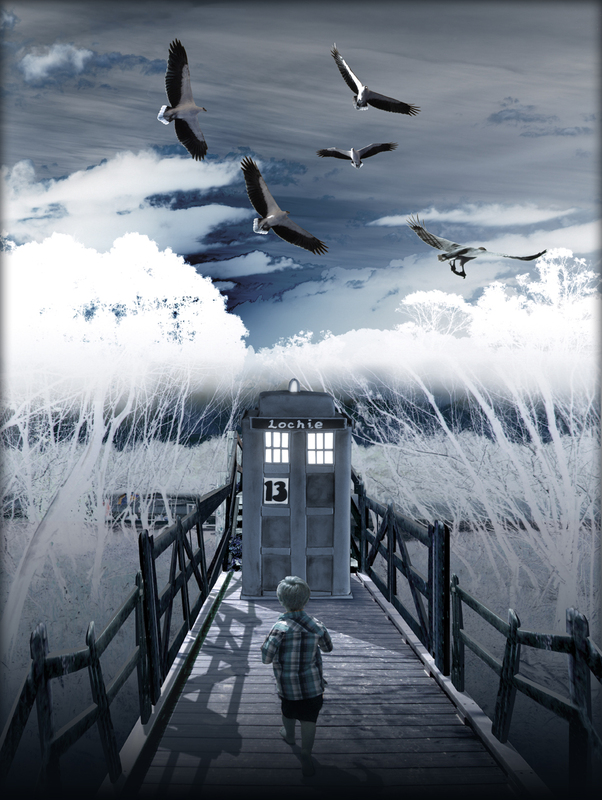 I took a picture of Callum on the boardwalk leading to the creek at Pottsville. I inverted the trees either side and added the steps from a picture taken at Norries Head, Cabarita. The fence is from a friend’s garden in Springbrook National Park. All the shadows on the boardwalk are just painted on in Photoshop and the birds are several shots of the one bird, a White-bellied Sea-Eagle, taken at Murwillumbah, flying overhead on the banks of the Tweed River near Dallis Park.